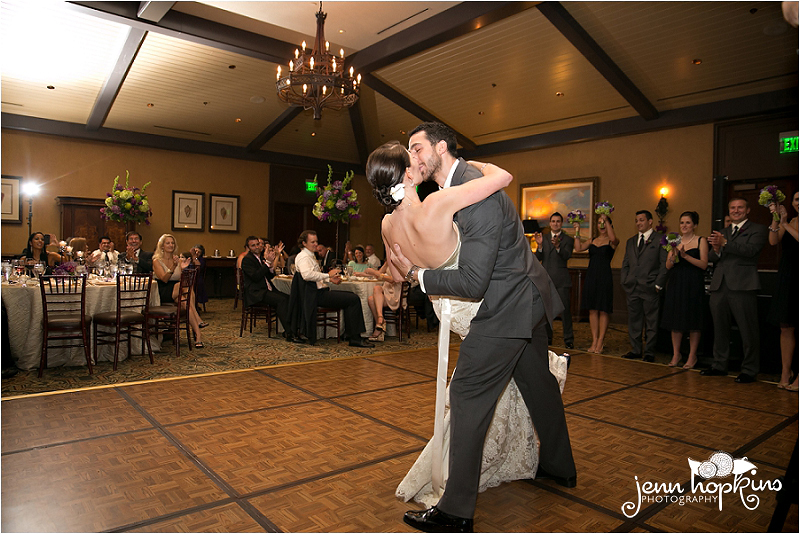 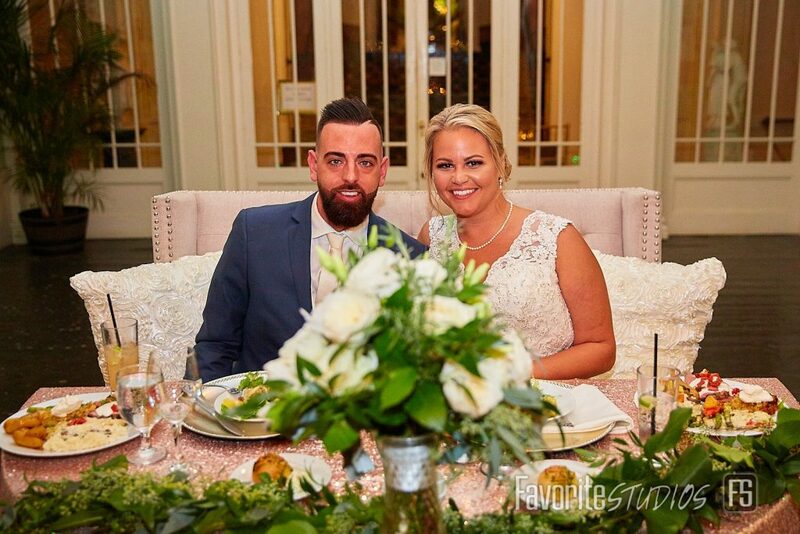 Laura and Jamey were married in a romantic ceremony followed by a beautiful reception at the Timiquana Country Club. 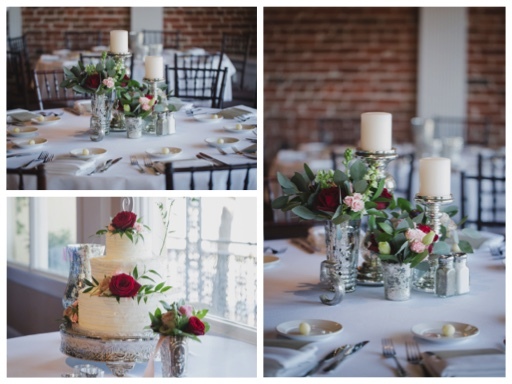 We loved working with Laura and creating her classic floral vision. 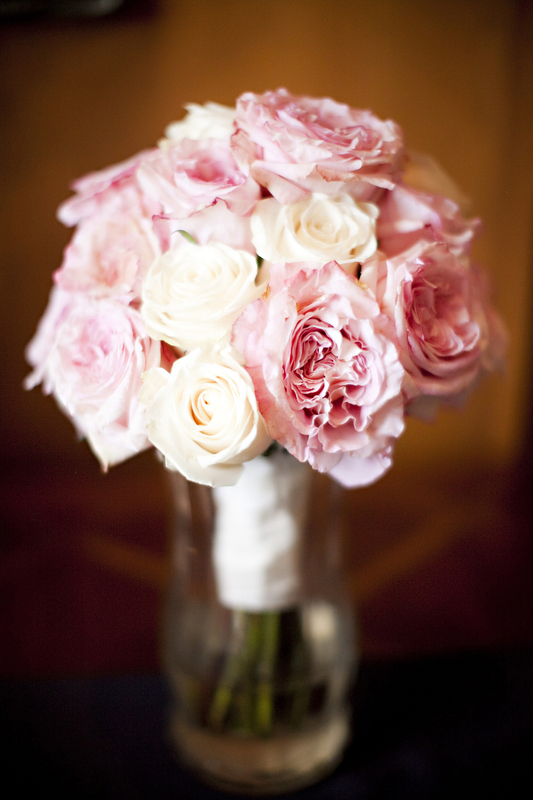 Laura carried a textured bouquet created with roses, and white ranunculus. 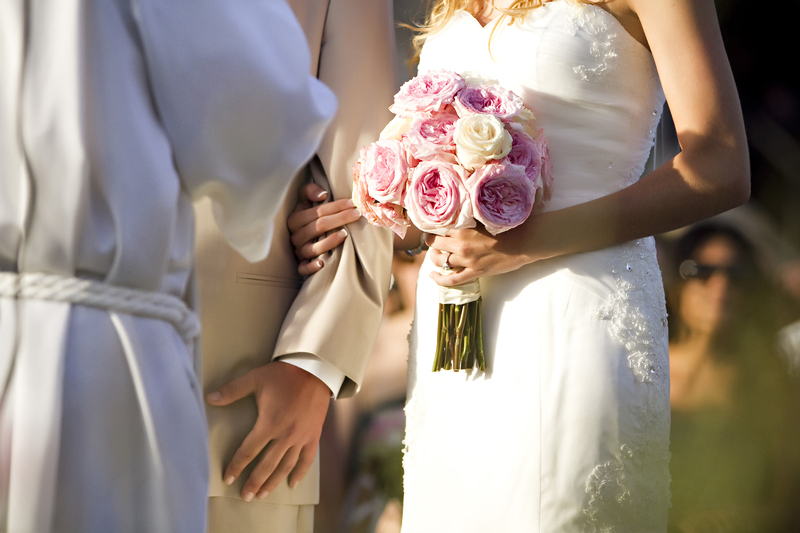 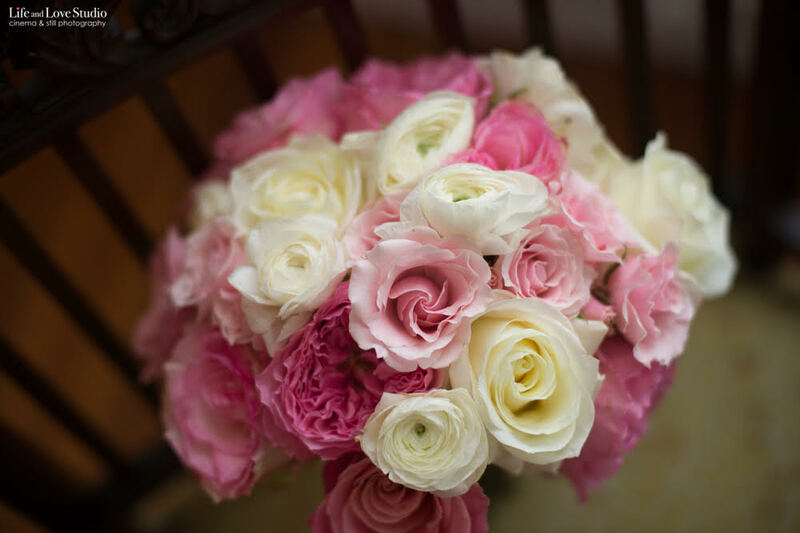 The bouquet was white and light pink with pops of dark pink. 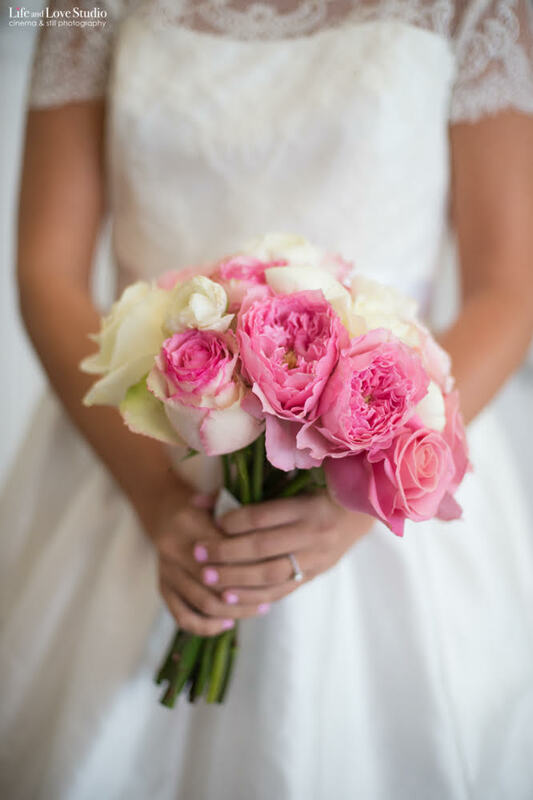 The girls carried white bouquets made of roses, spray roses, stock, and ranunculus. 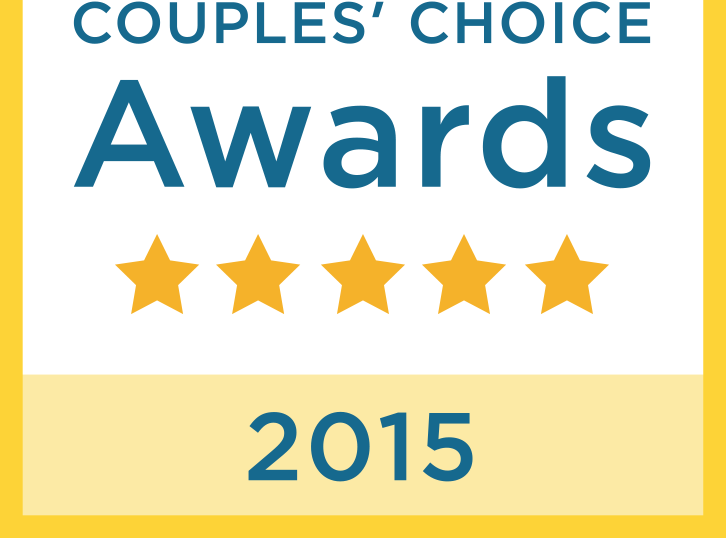 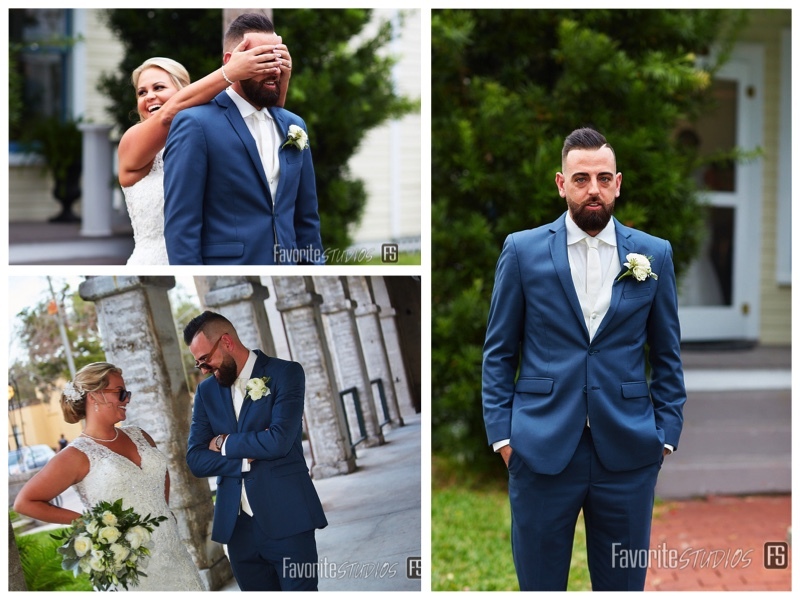 Jamey and Laura were married at Memorial Presbyterian Church. 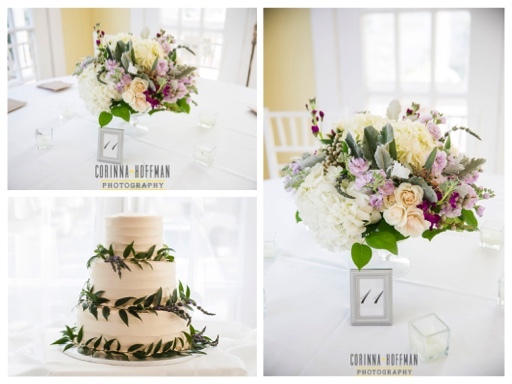 The altar had two arrangments of white and mixed foliage. 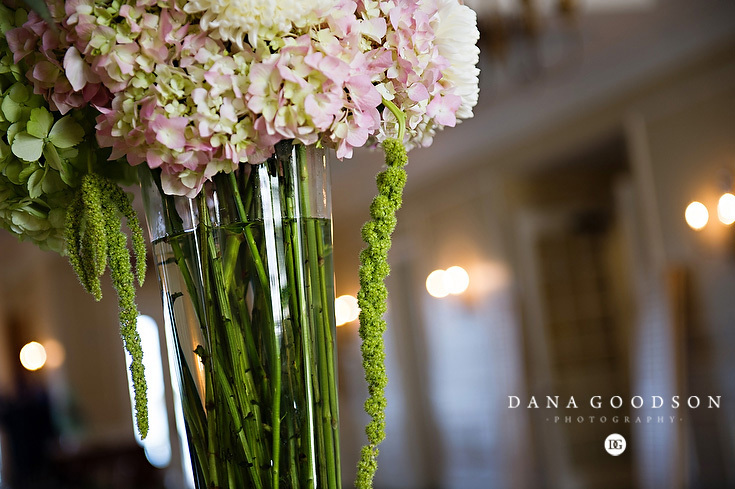 The flowers included hydrangeas, roses, snapdragons, and stock. 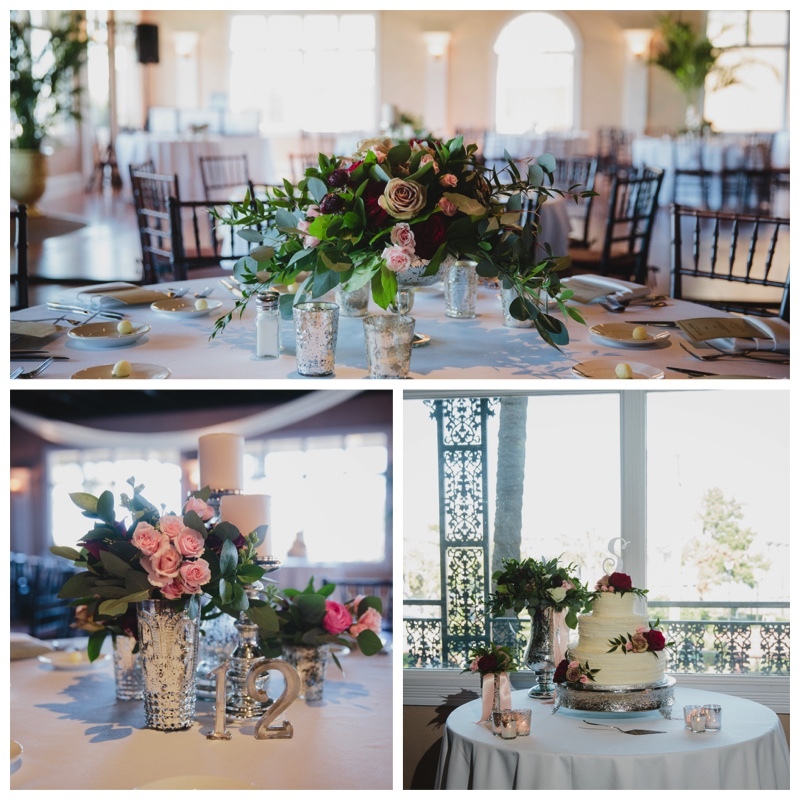 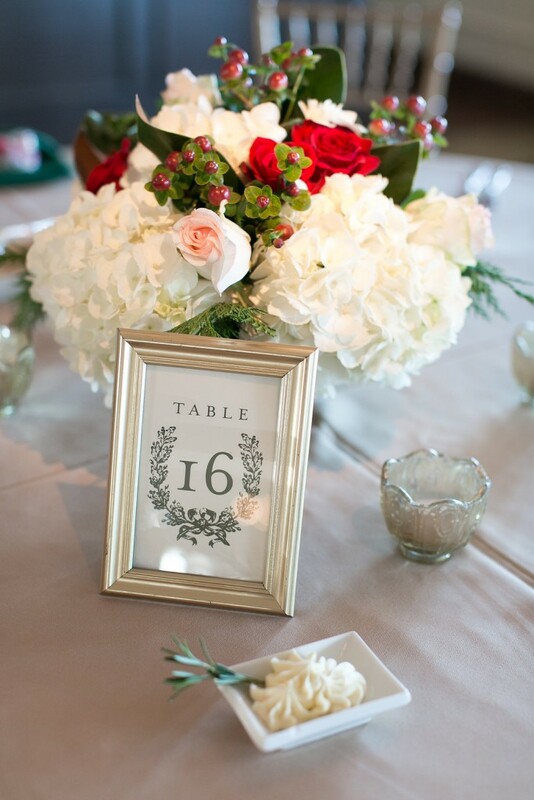 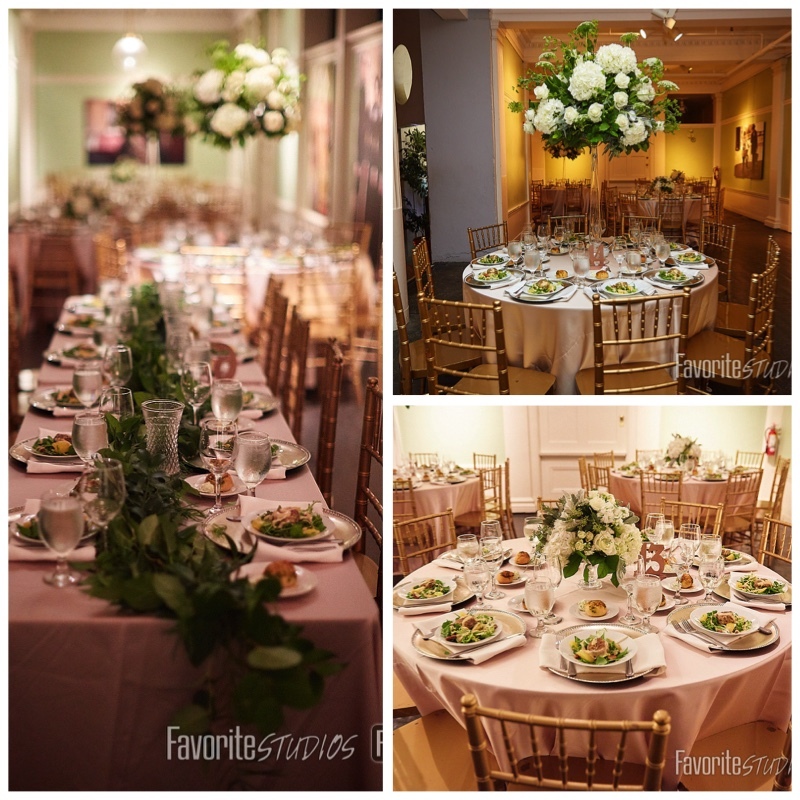 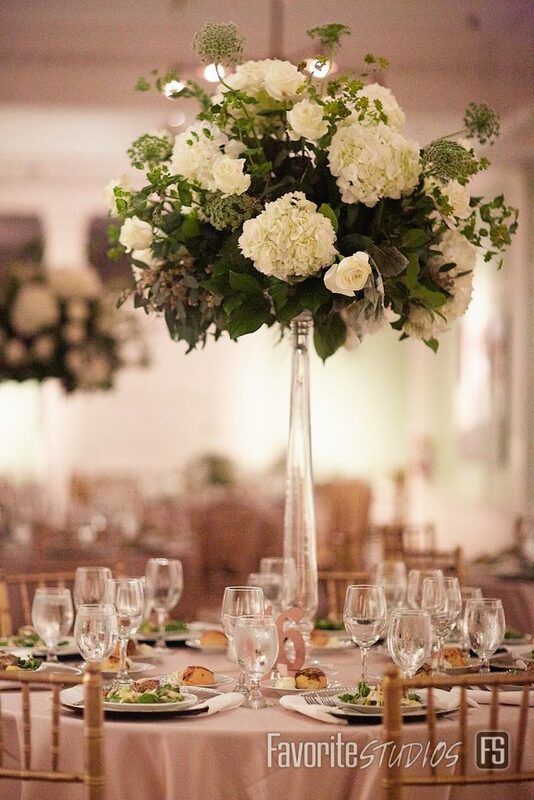 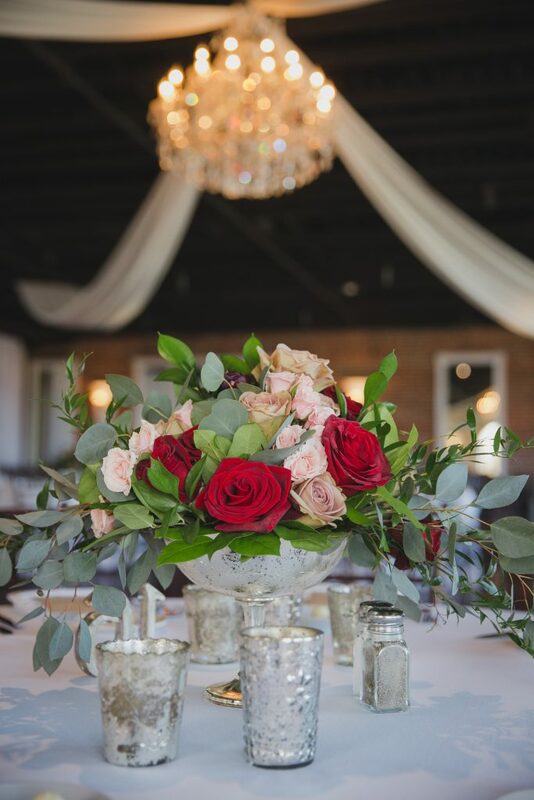 Laura and Jamey’s reception was wonderfully romantic with classic flowers. 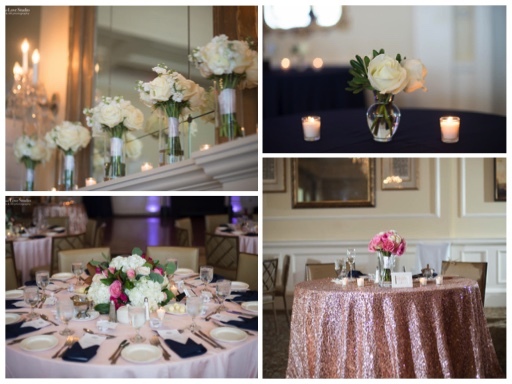 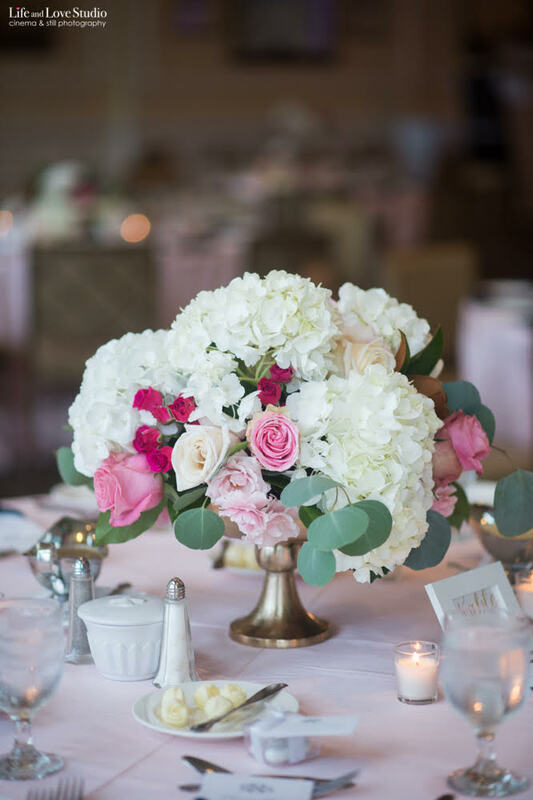 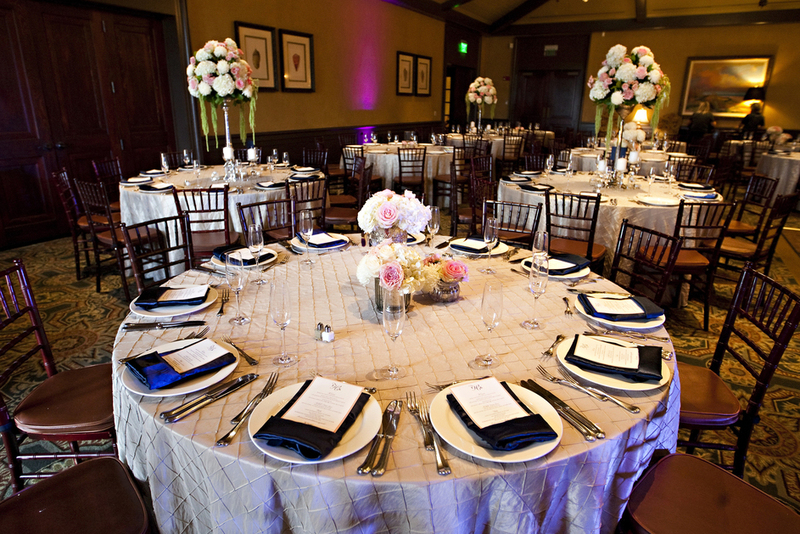 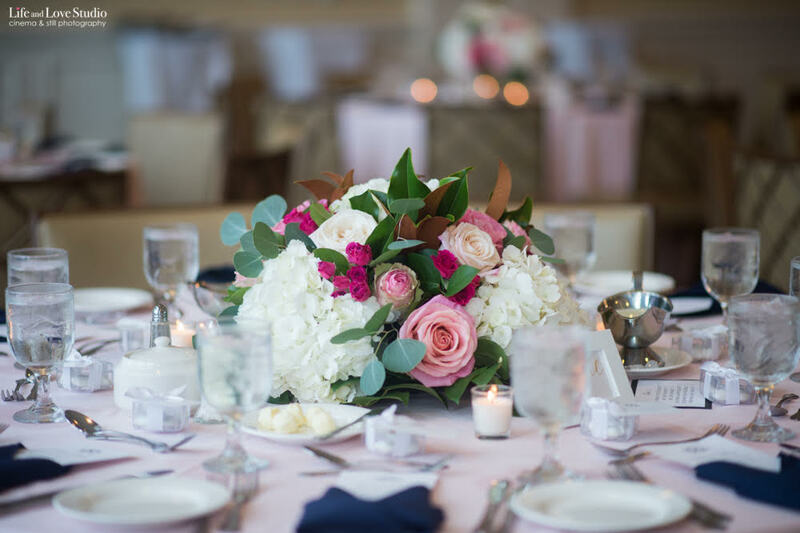 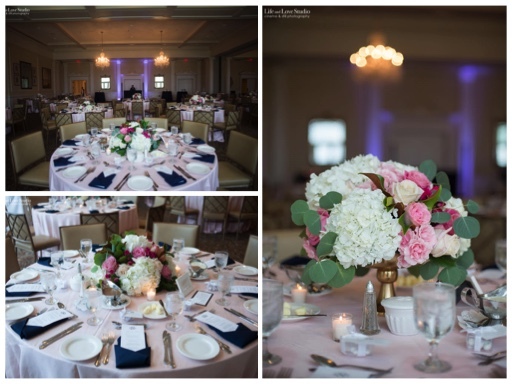 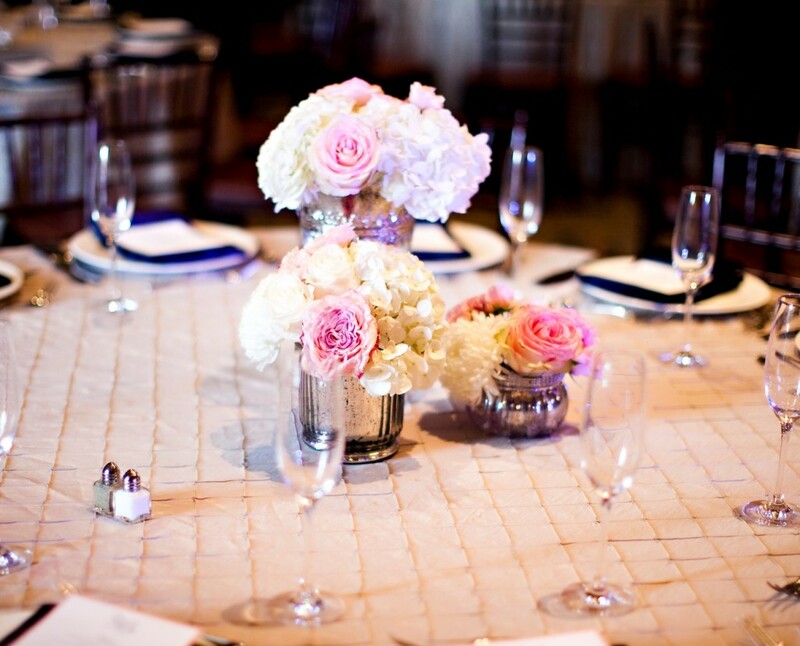 The centerpeices were created with shades of light pink and white flowers with accents of dark pink and foliage. 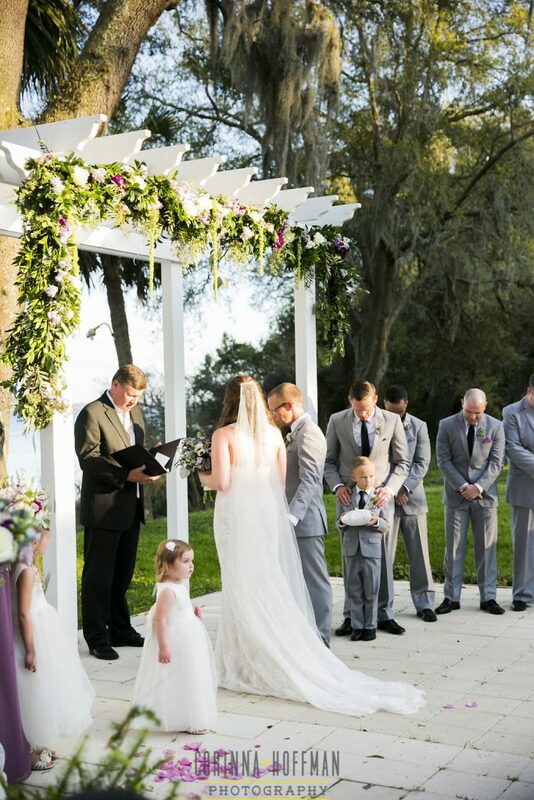 Clint and Erin said “I Do” in a outside garden ceremony at the Winterbourne Inn. 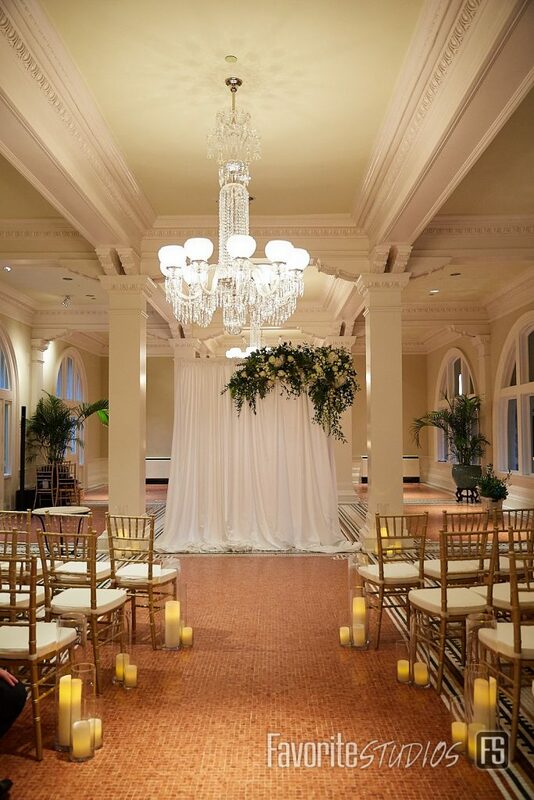 A elegant, garden reception followed. 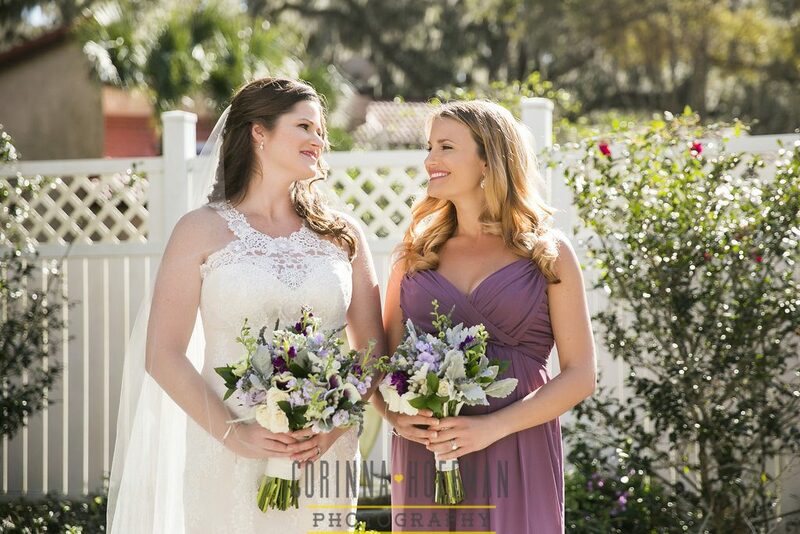 Erin was a joy to work with. 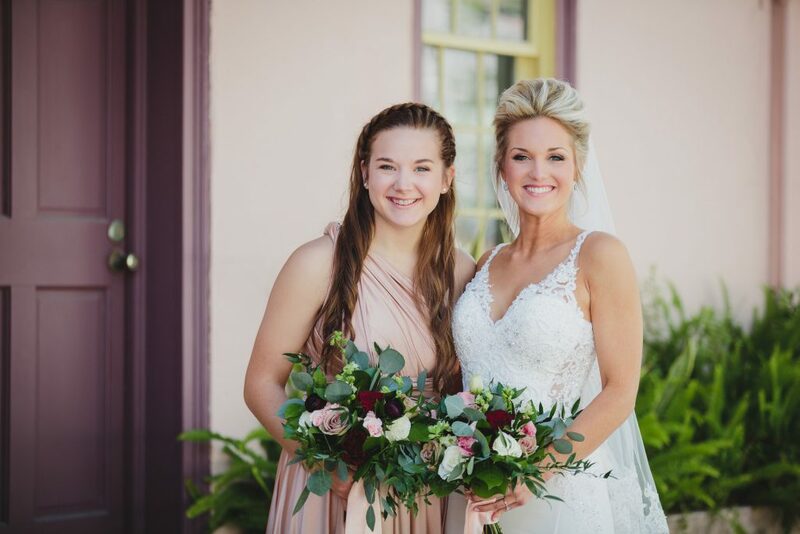 We loved her vision and making it come to life. 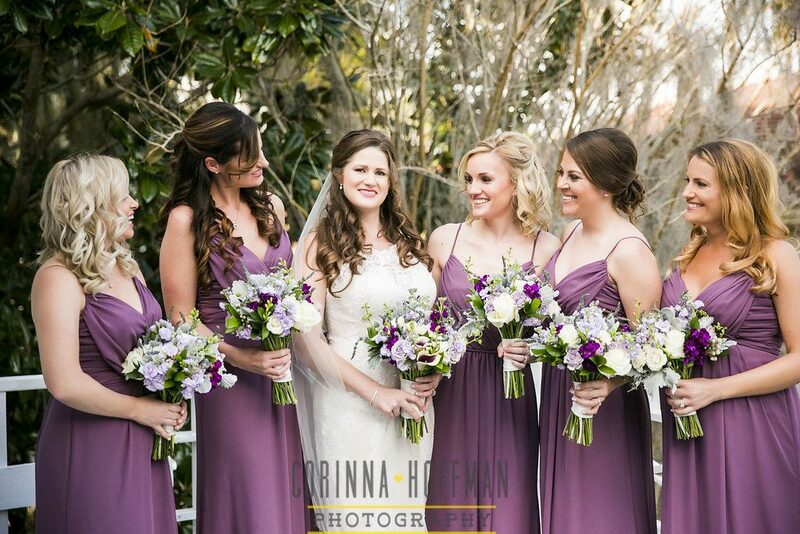 Erin carried a beautiful bouquet of lavender, purple, gray, and green. 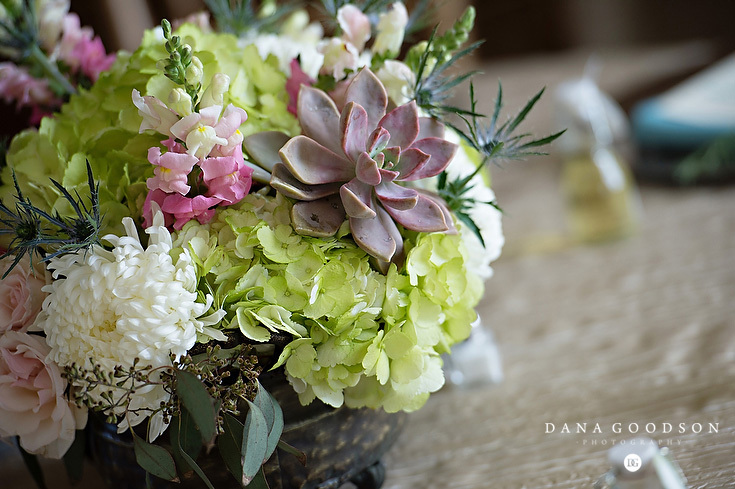 It was made using stock,spray roses, brunia, dusty miller, heather, mini callas, and larkspur. 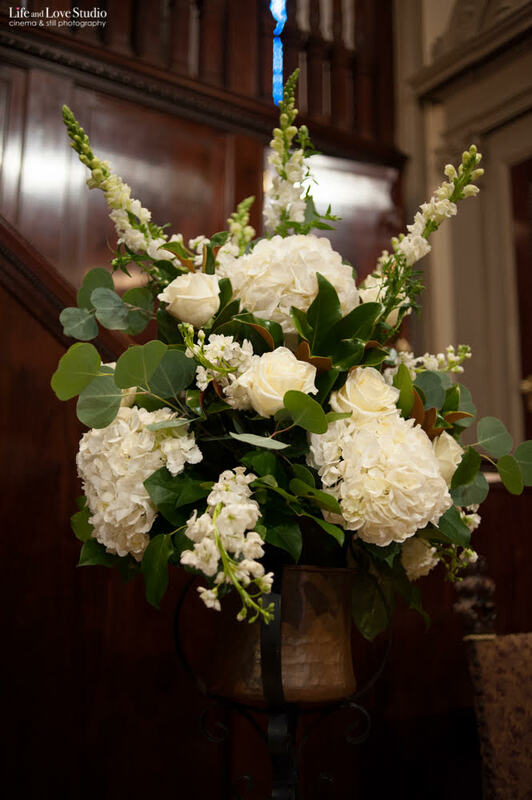 The bouquet had touches of polar star roses, seeded eucalyptus, and Israeli ruskus. 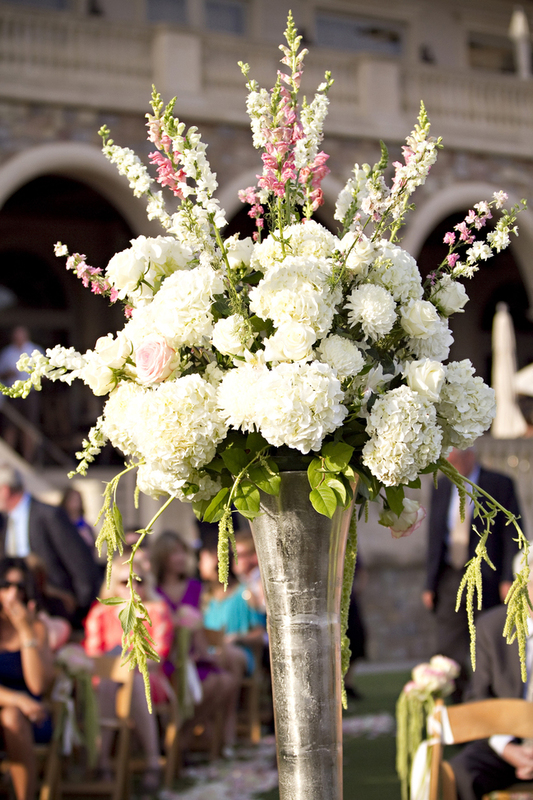 The girls carried bouquets that were like Erin’s but did not inclide the calla lillies. 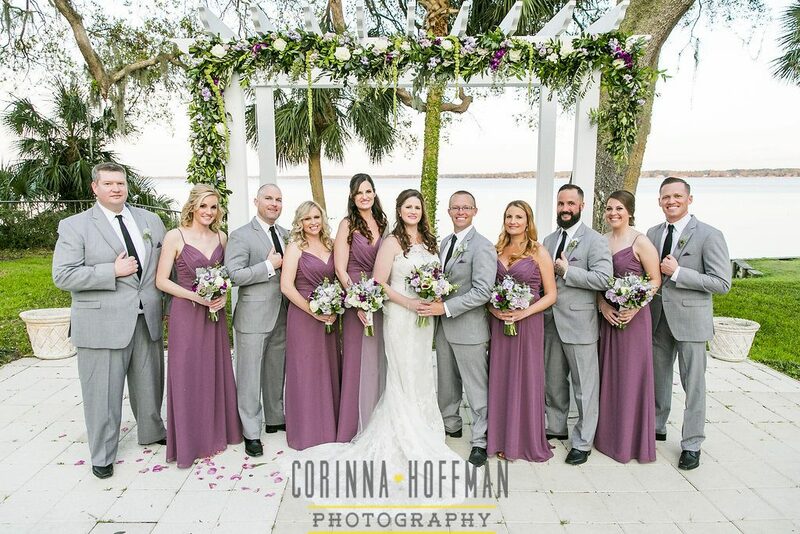 The purple,gray, and green color pallet looked stunning against their purple dresses. 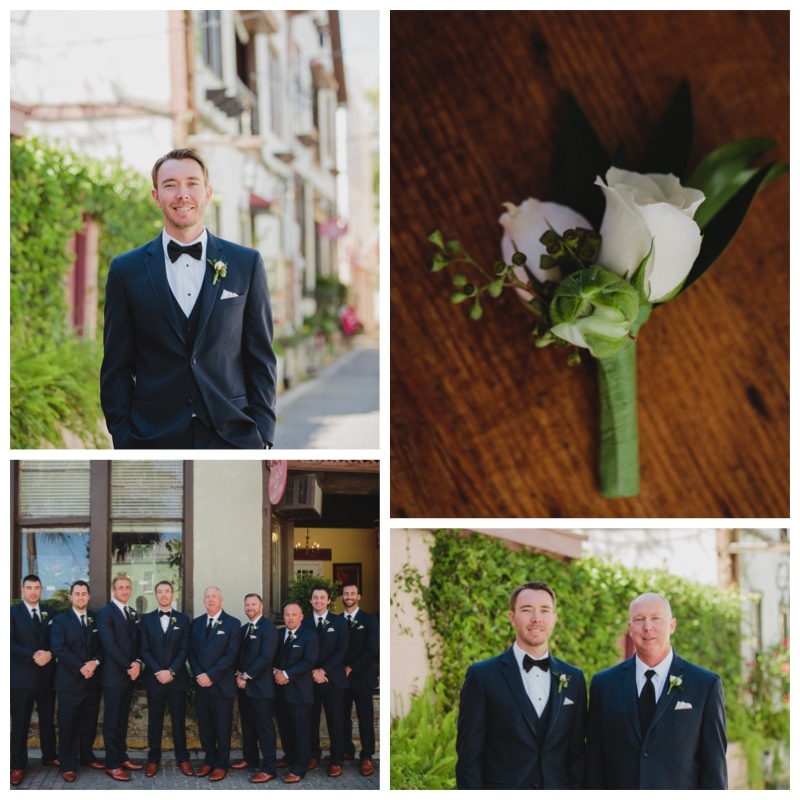 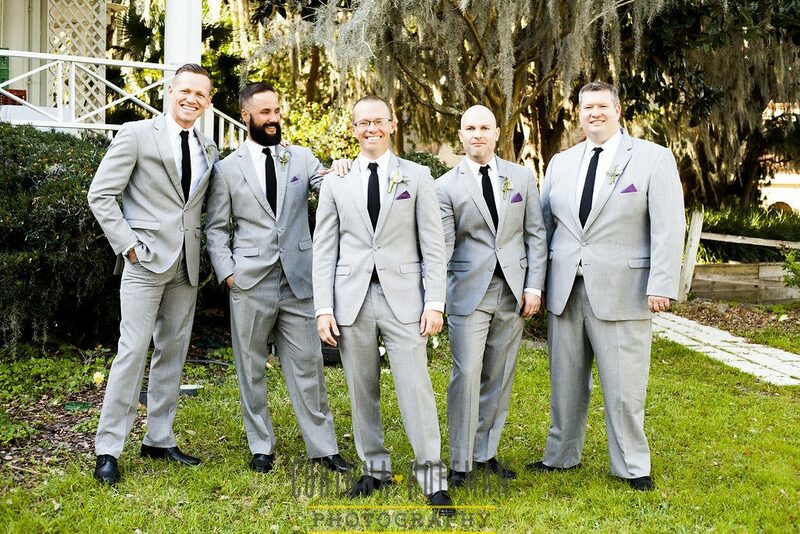 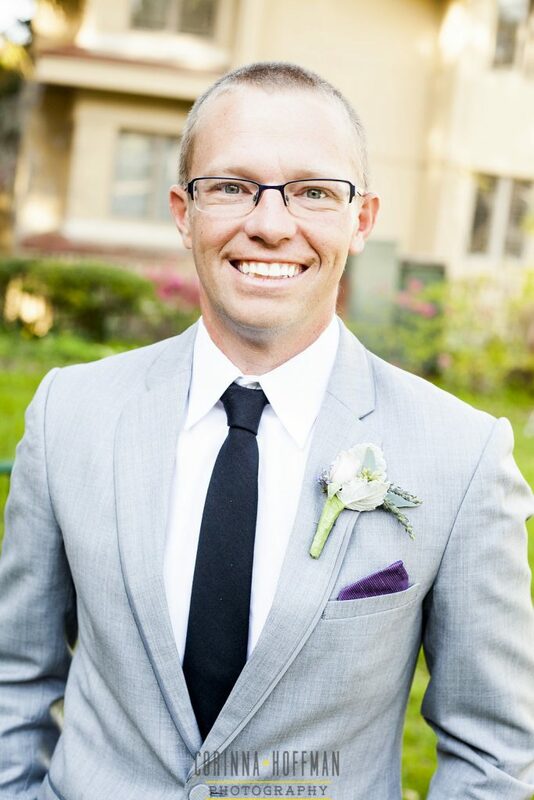 Clint and his groomsmen wore boutonnieres made of heather, dusty miller, and eucalyptus. 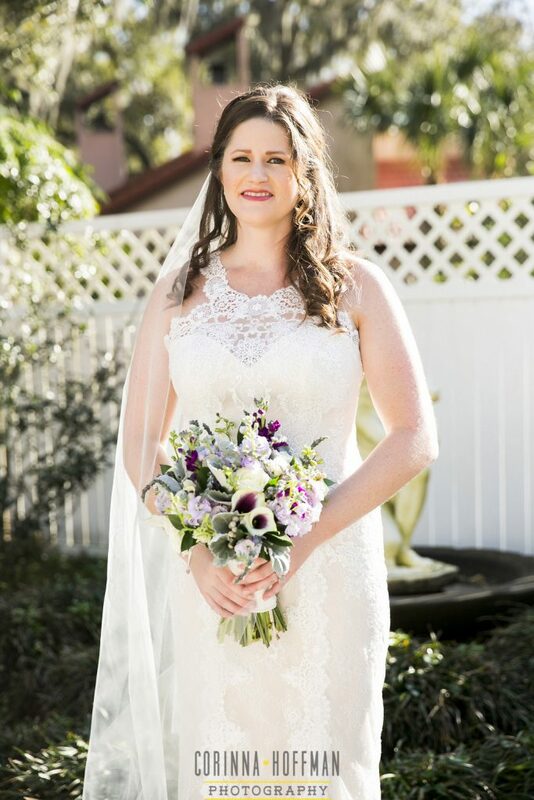 Clint and Erin became husband and wife under an arch adorned with mixed greenery and lavander, purple, white, and gray flowers. 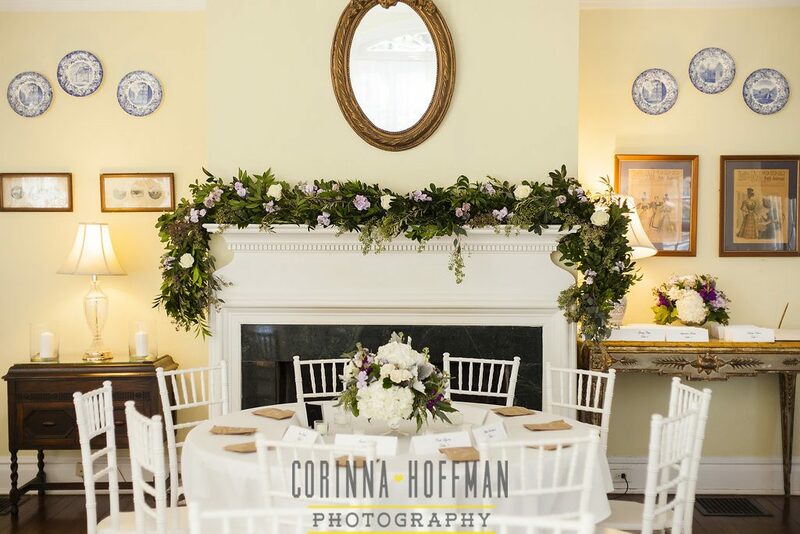 The mantle had a mixed garland with touches of flowers. 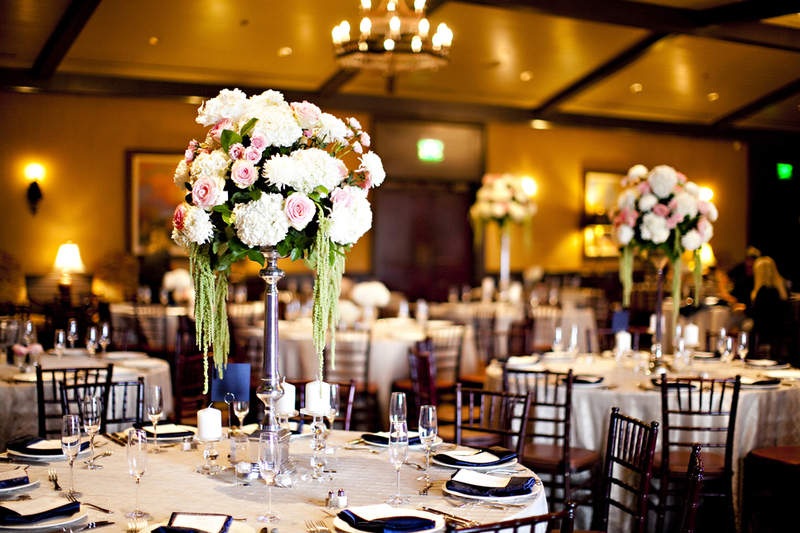 The centerpieces were made of complimenting flowers in pedestal vases. 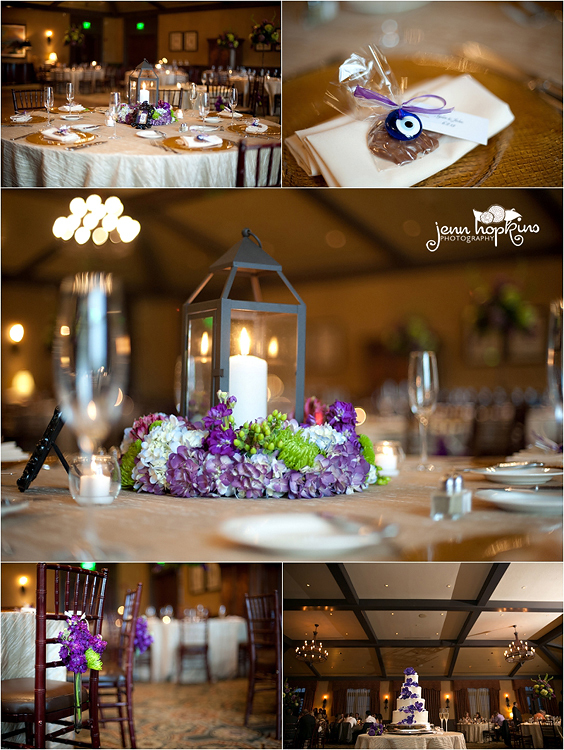 Willow eucalyptus accented with lavendar was placed around each layer of the cake. 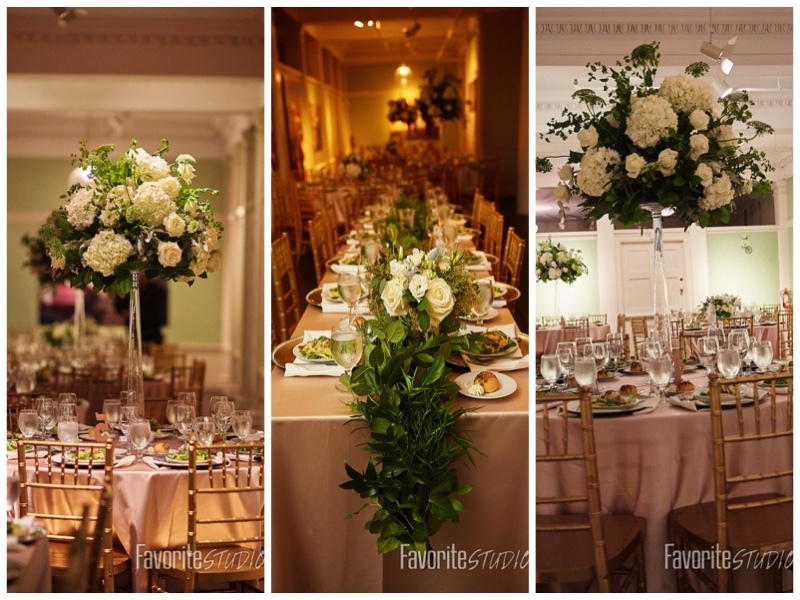 We loved the classic, romantic, garden look of Erin and Clint’s reception. 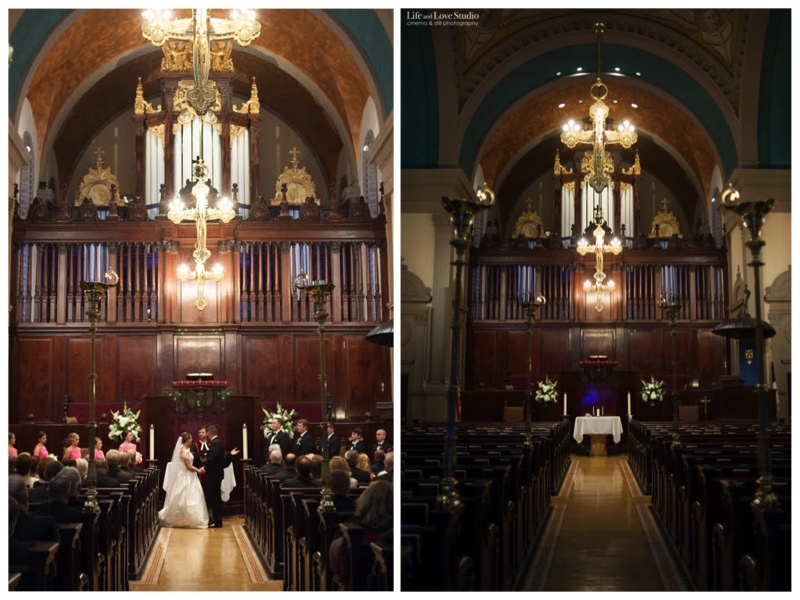 Paige and Paul were married in a ceremony at The Cathedral Basilica. 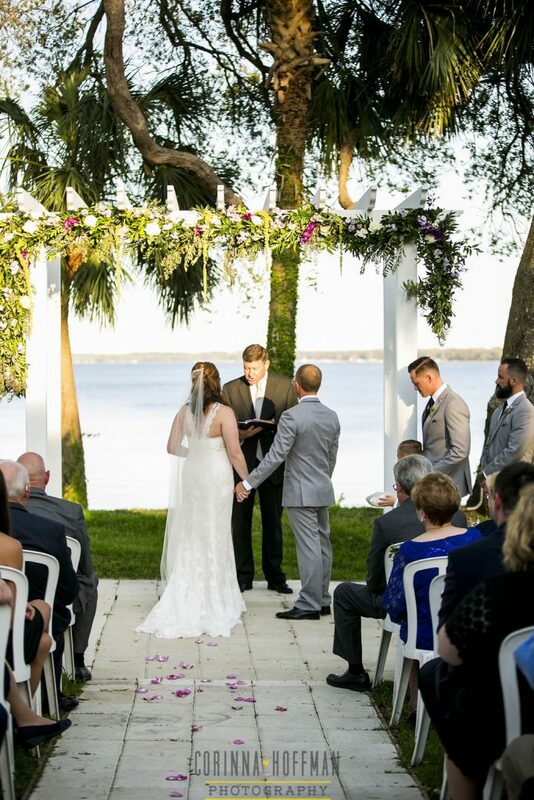 The beautiful reception was held at the River House. 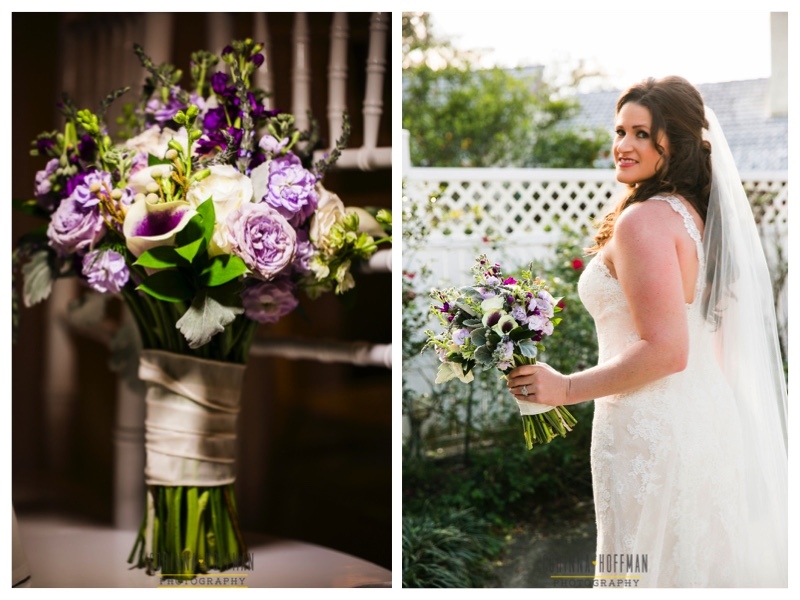 We loved working with Paige to create her floral vision. 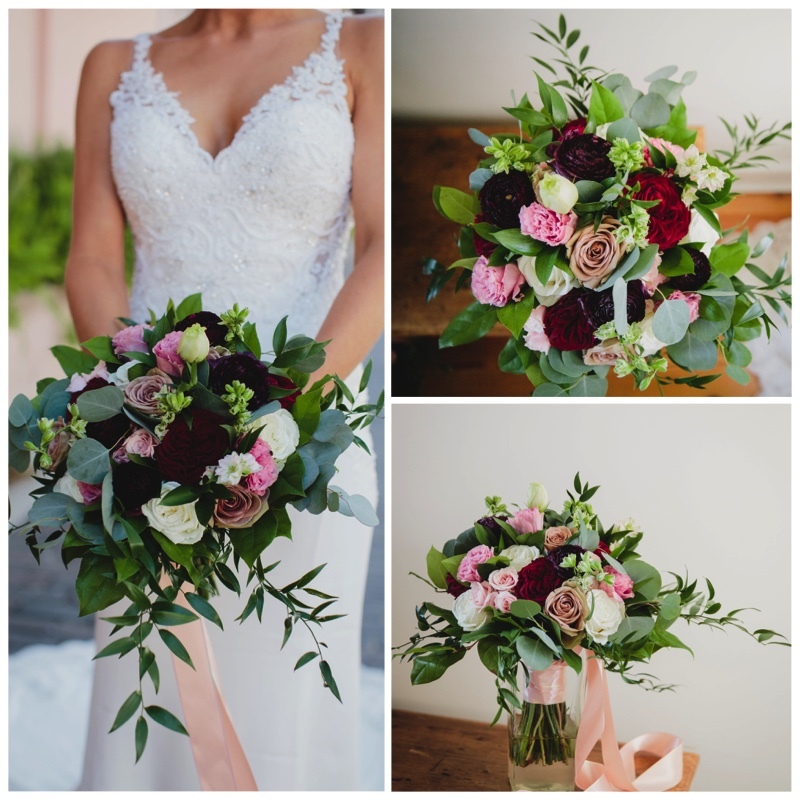 Paige’s cascading bouquet was created with ivory roses, gold succulents, and burgandy ranunculus. 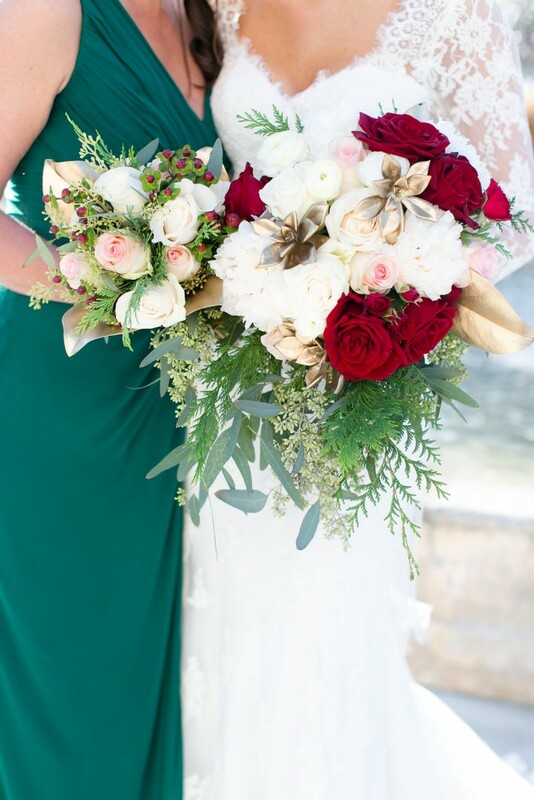 Hints of cedar, magnolia leaves, seeded eucalyptus, and blush roses accented the bouquet. 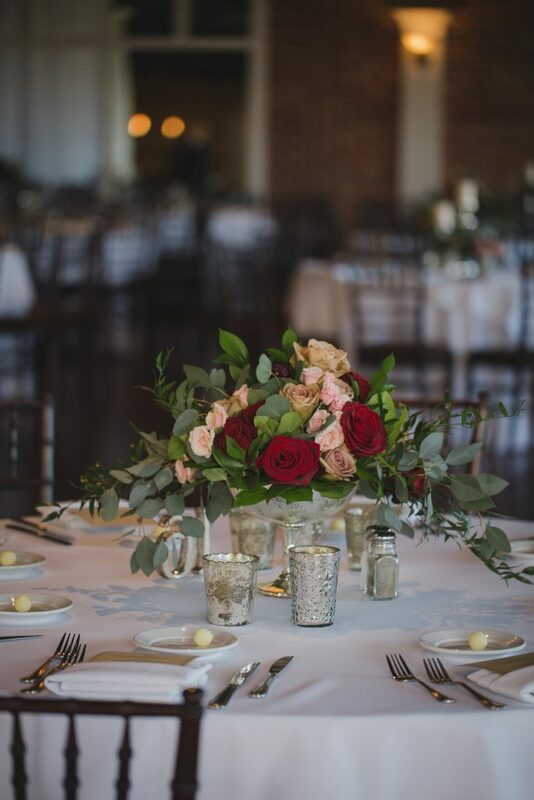 The bouquets were created with ivory and blush roses along with hints of burgandy hypercum berries and seeded eucalyptus. 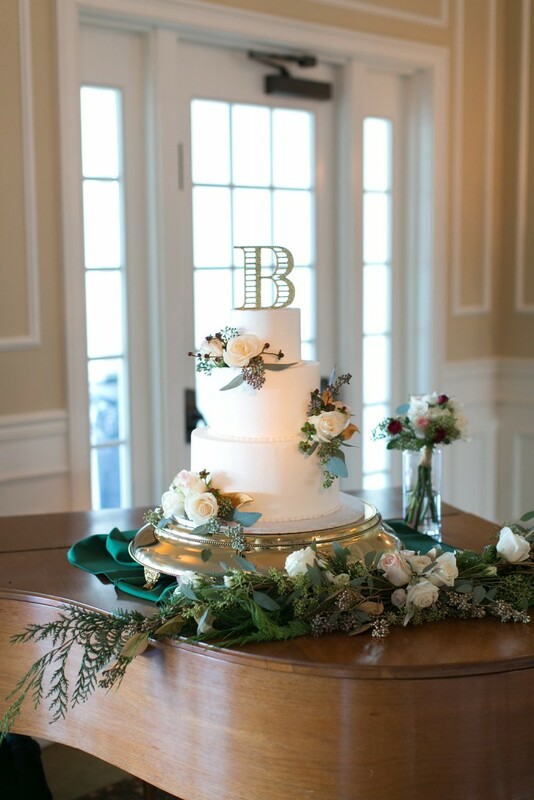 Tinted gold magnolia leaves surronded the bottom of the bouquet. 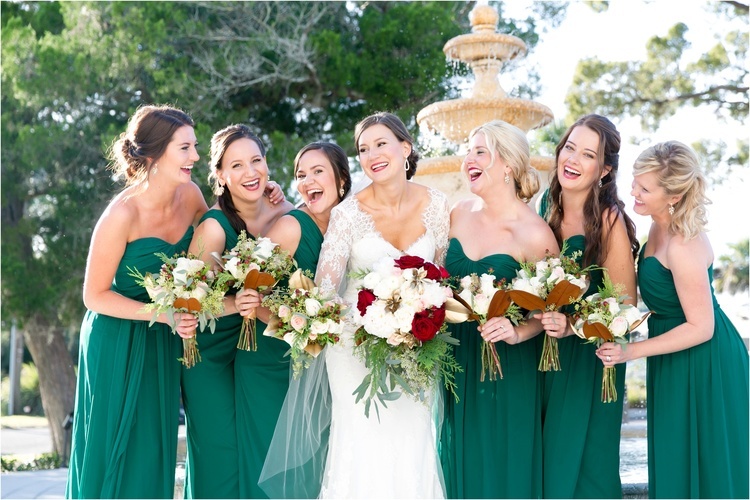 These bouquets were the perfect accent to the girls hunter green gowns. 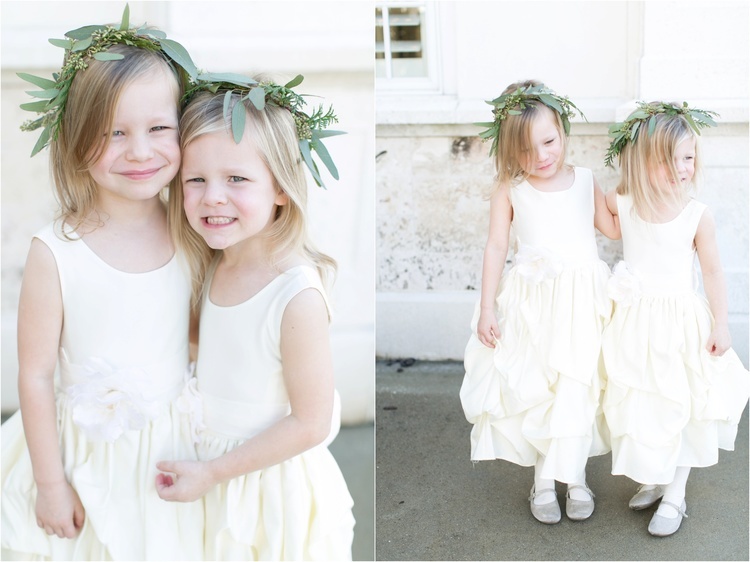 The adorable flower girls wore a garland crown made of cedar and seeded eucalyptus. 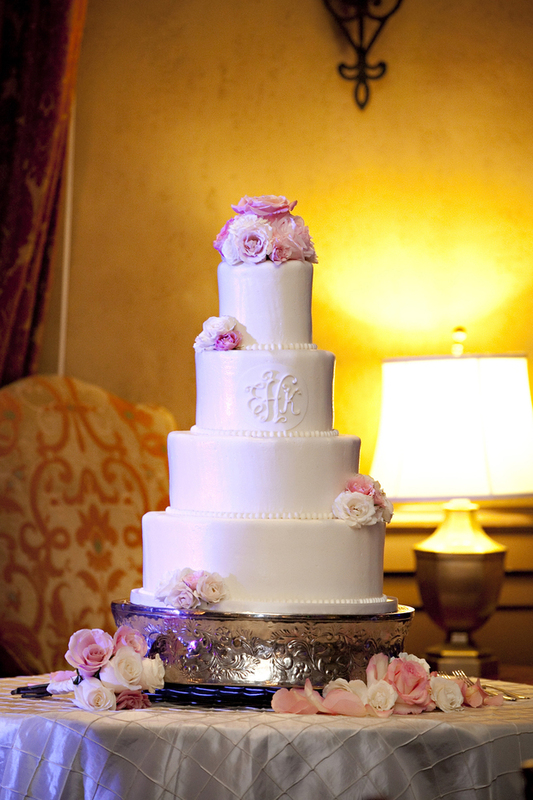 Each crown was accented with ivory and blush flowers. 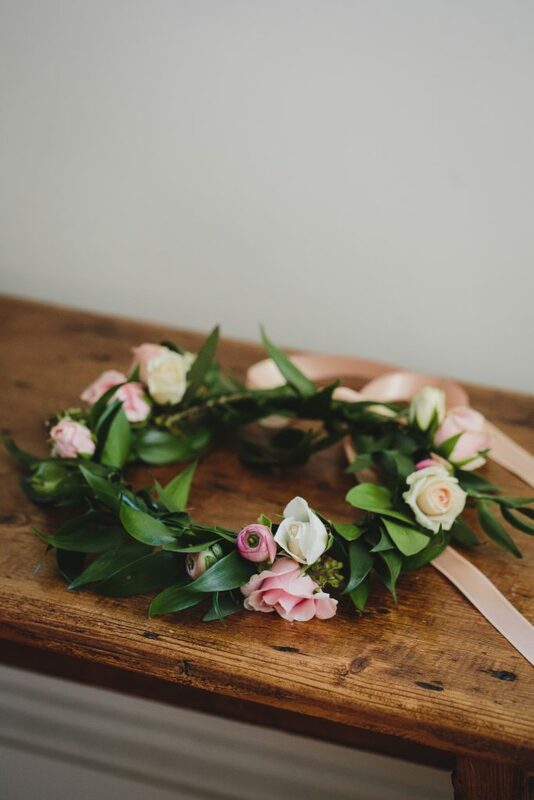 These lovely crowns were used as garland around the cake during the reception. 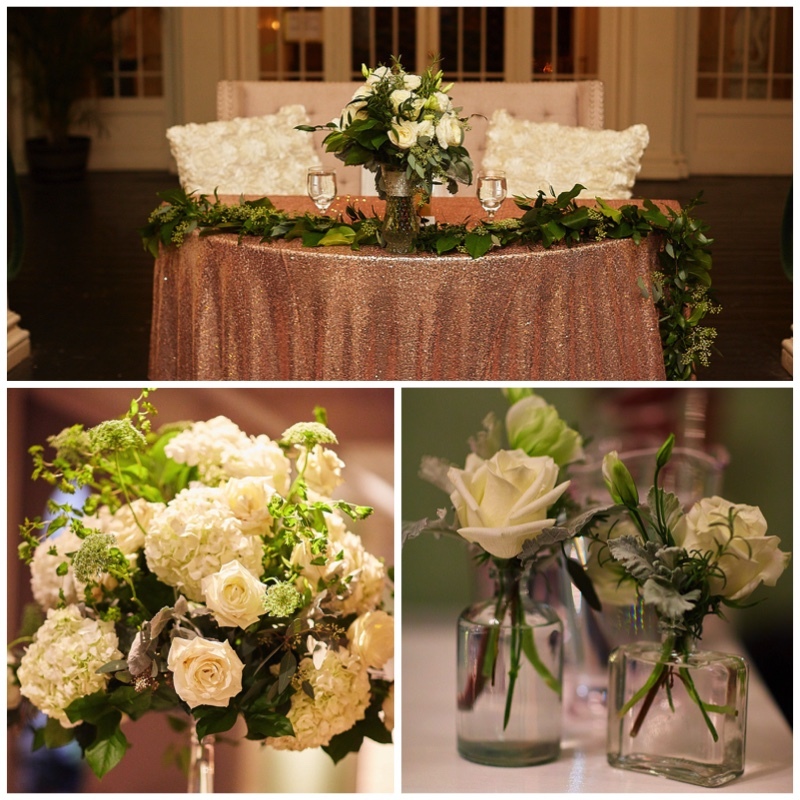 The Head Table was adorned with gold mercury vases were the girls placed their bouquets. 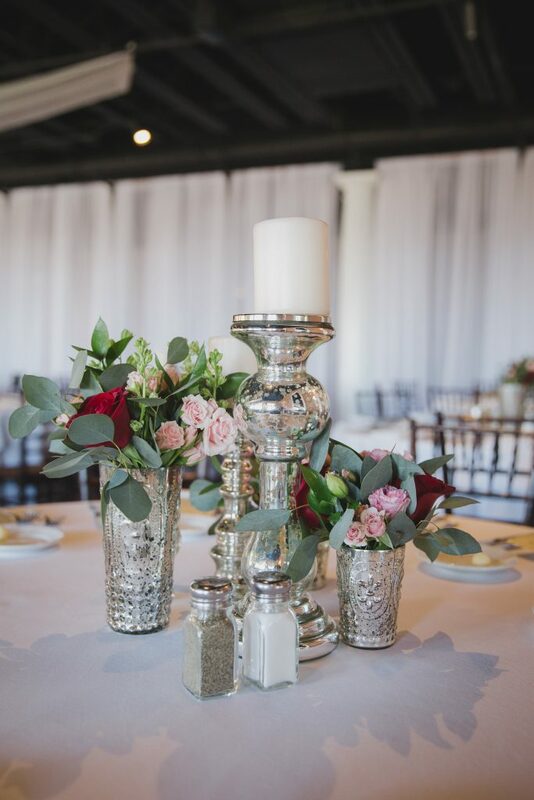 Gold votive holders, vases with candles, and gold pilar candle holders added romantic lighting to the head table. 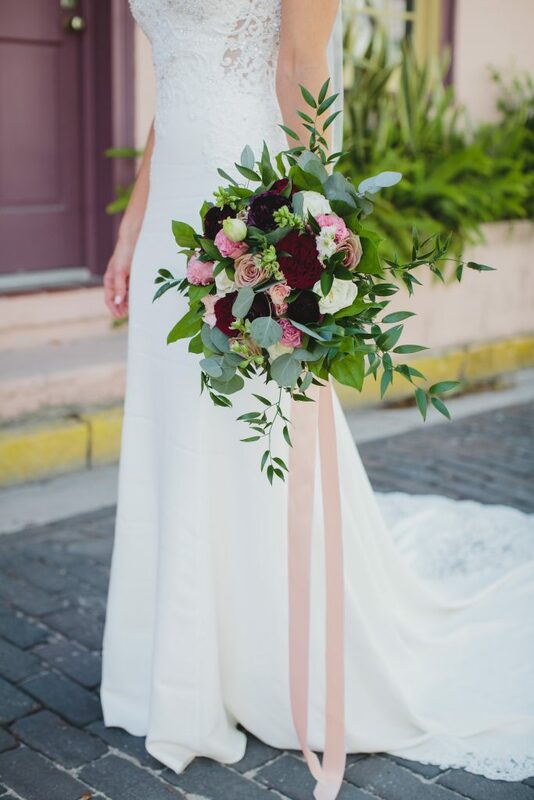 Cascading arragments were created using ivory and burgandy flowers highlighted with a hint of blush. 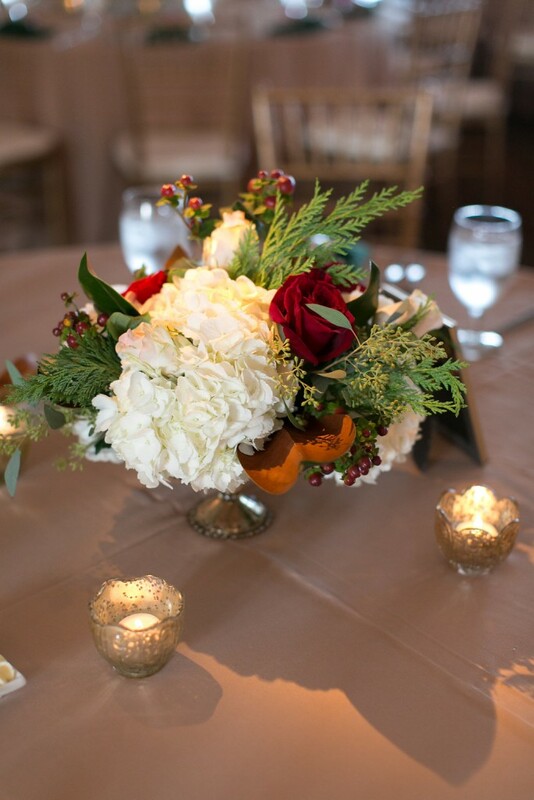 Cedar, gold magnolia, and seeded eucalyptus were used as accents. 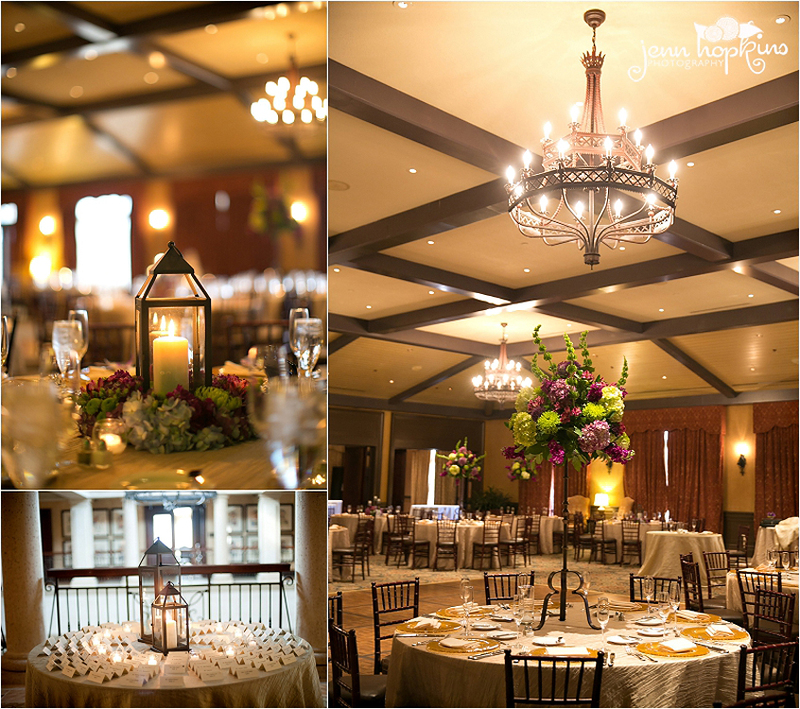 These breathtaking arrangments were surrounded by gold candle holders. 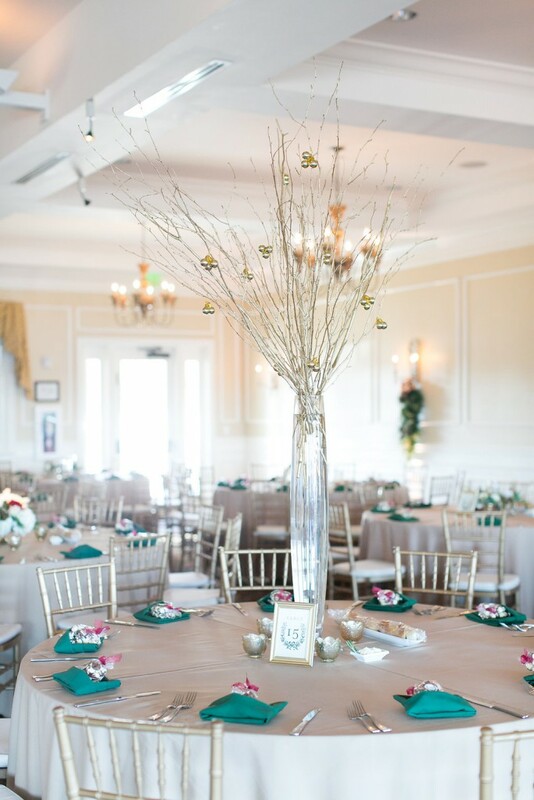 Gold branches and small golden ornaments filled the tall cylinder vases that put the finishing touches on this beautiful reception. 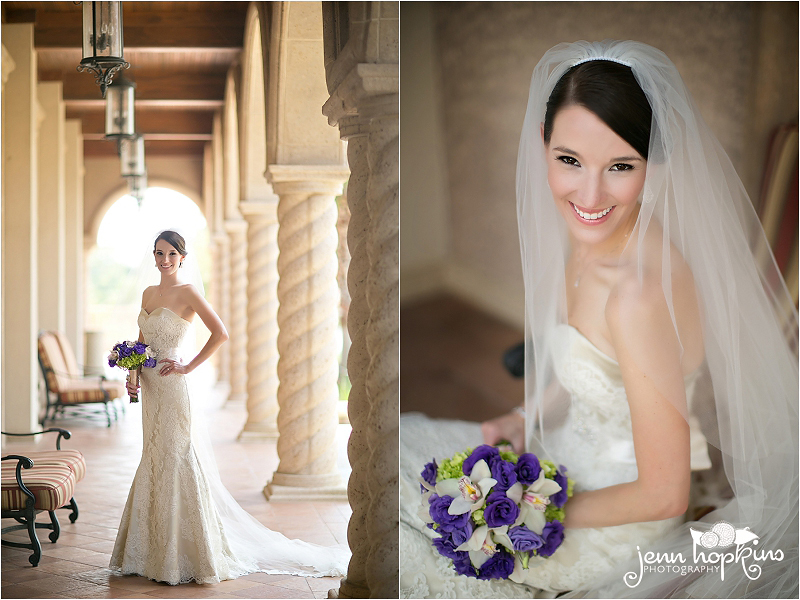 Aylin & John had the most beautiful wedding at TPC sawgrass in Ponte Vedra. 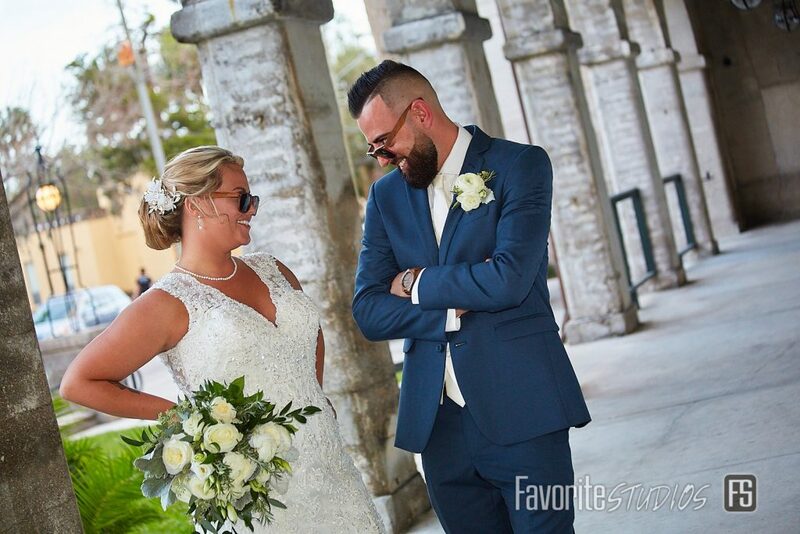 As you can see, they are a couple that just lets their love for one another glow. 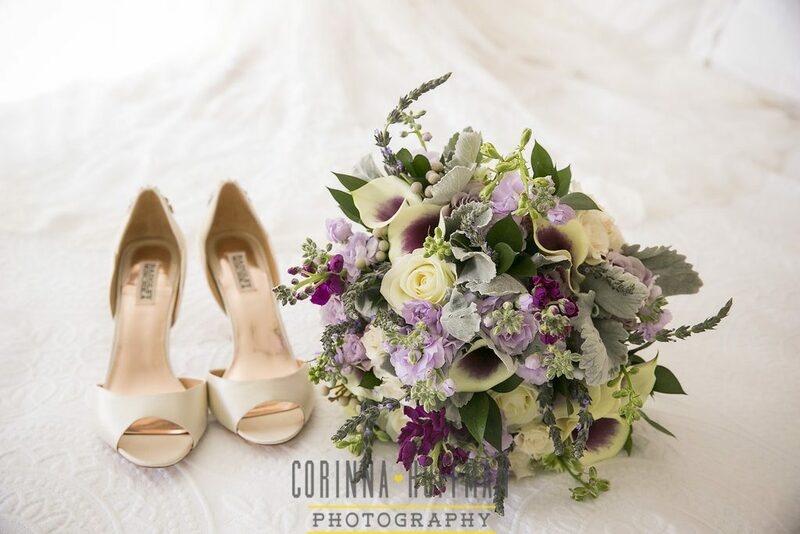 We loved Aylin’s color choice for her bouquets. 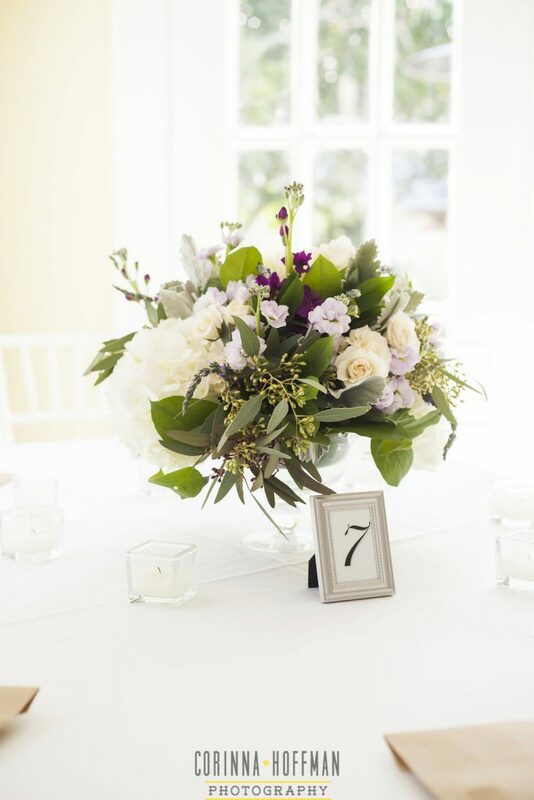 We used green mini hydrangeas, clustered purple lisianthus and a touch of cymbidium orchids with purple throats to bring it all together. 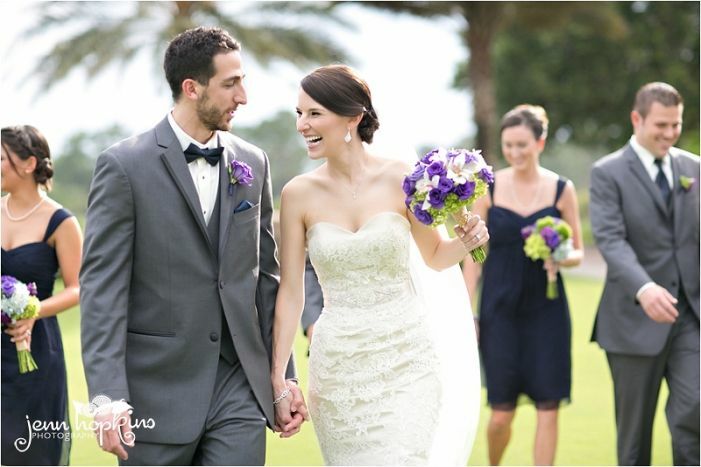 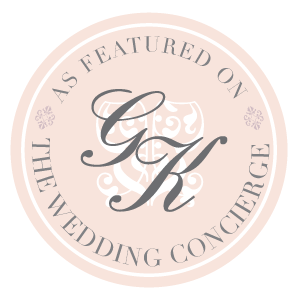 Erica & Kyle had a gorgeous wedding on the lawn of TPC Sawgrass. 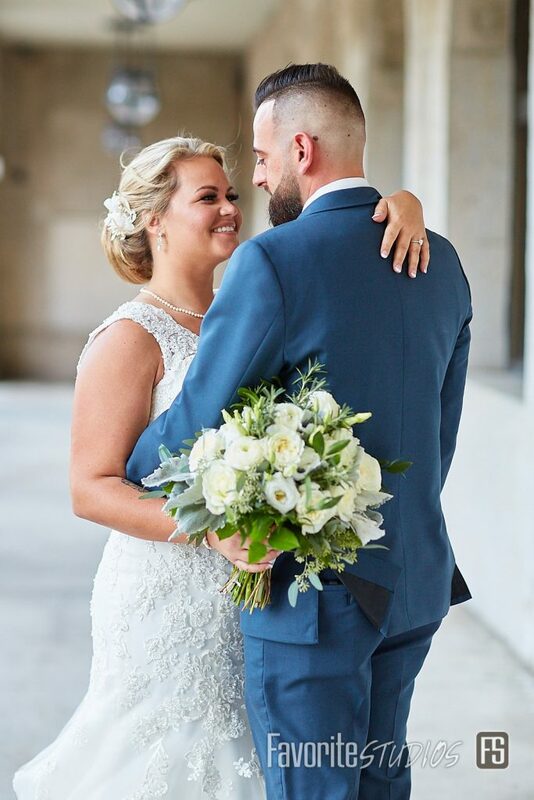 We were thrilled to provide the bouquets, ceremony florals, along with the reception florals for their beautiful wedding day. 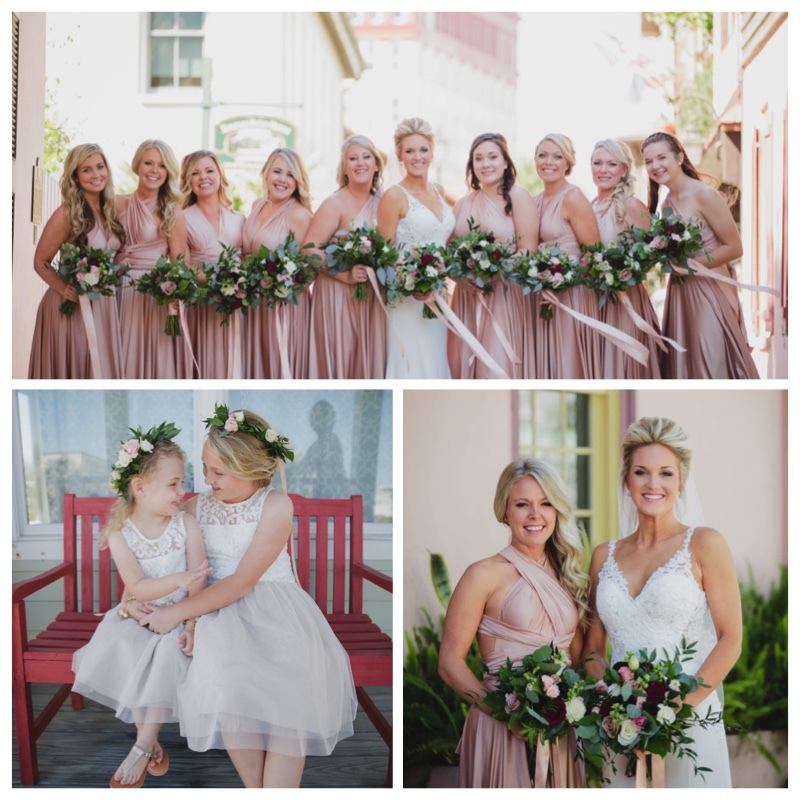 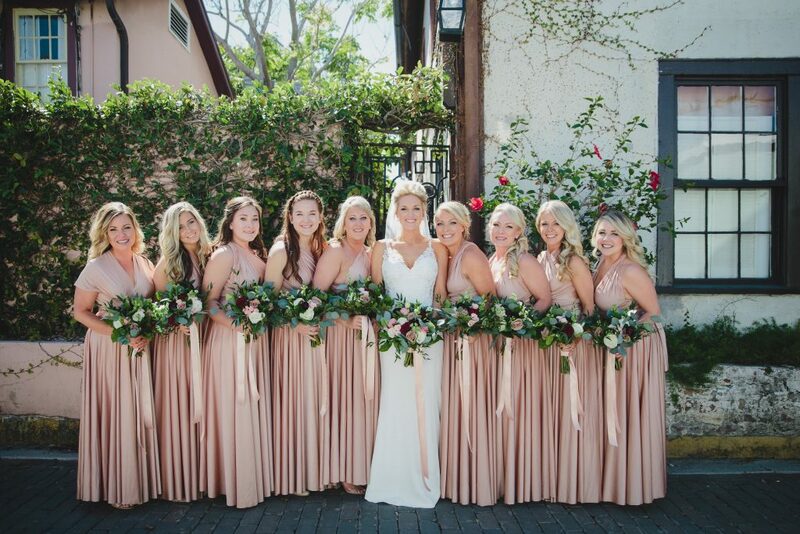 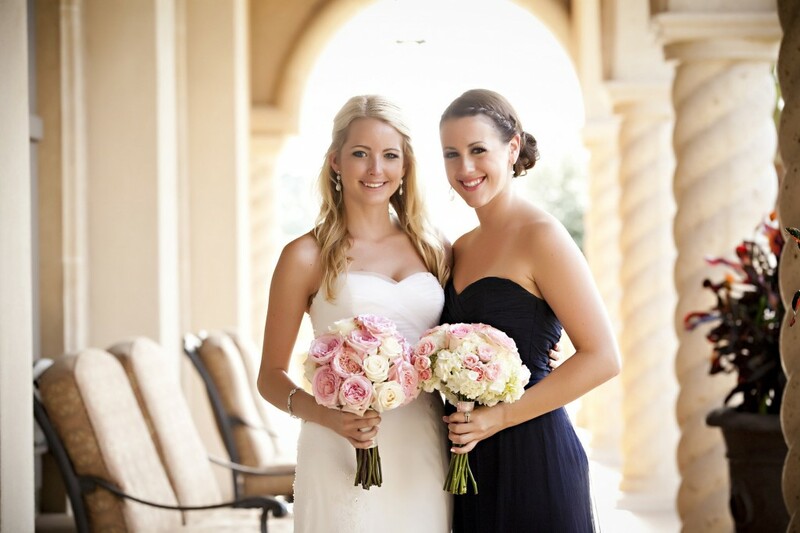 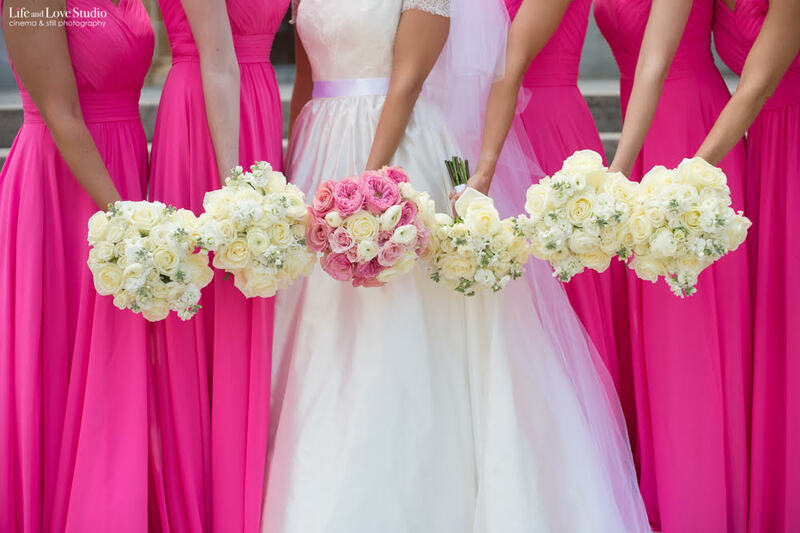 Erica wanted to go with ivories and pinks for her wedding day, and it couldn’t have been more beautiful! 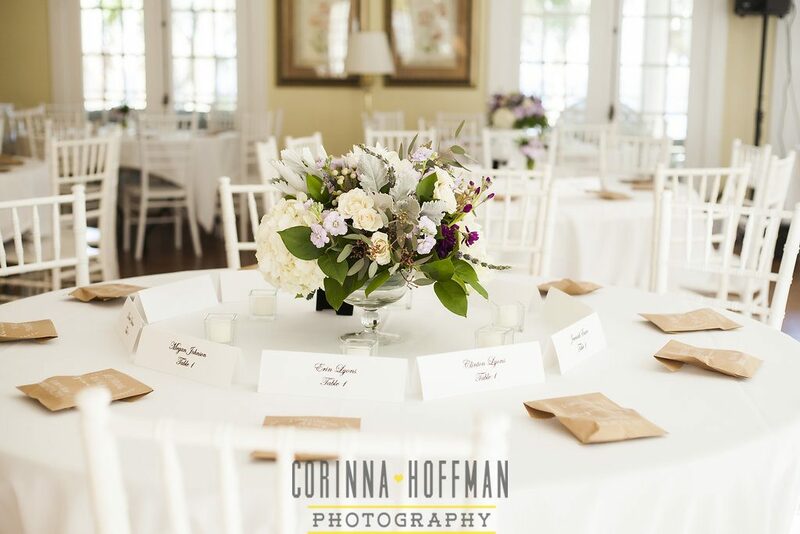 Beautiful images by Corinna Hoffman. 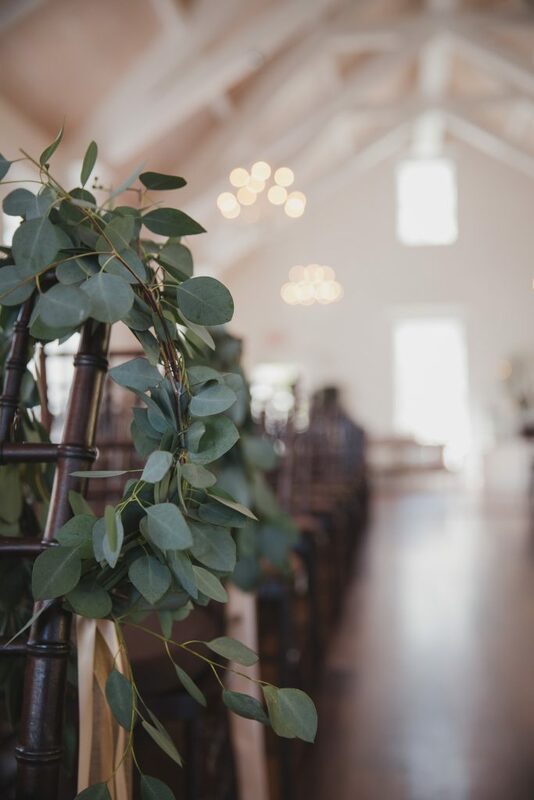 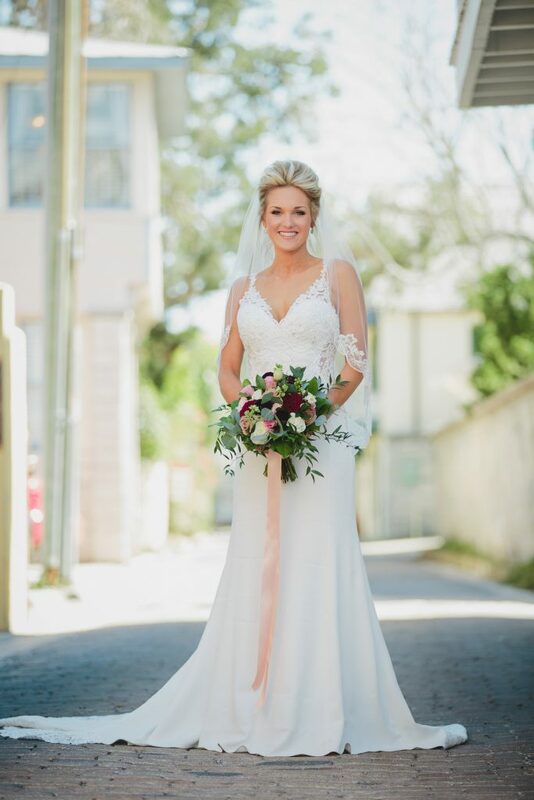 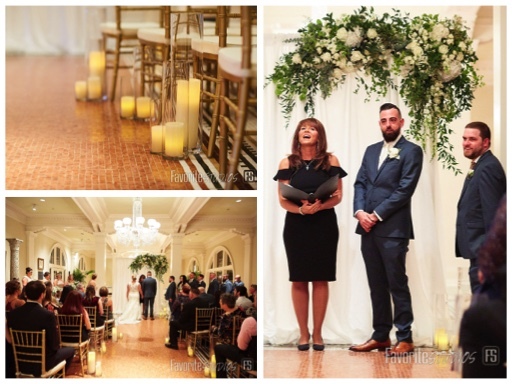 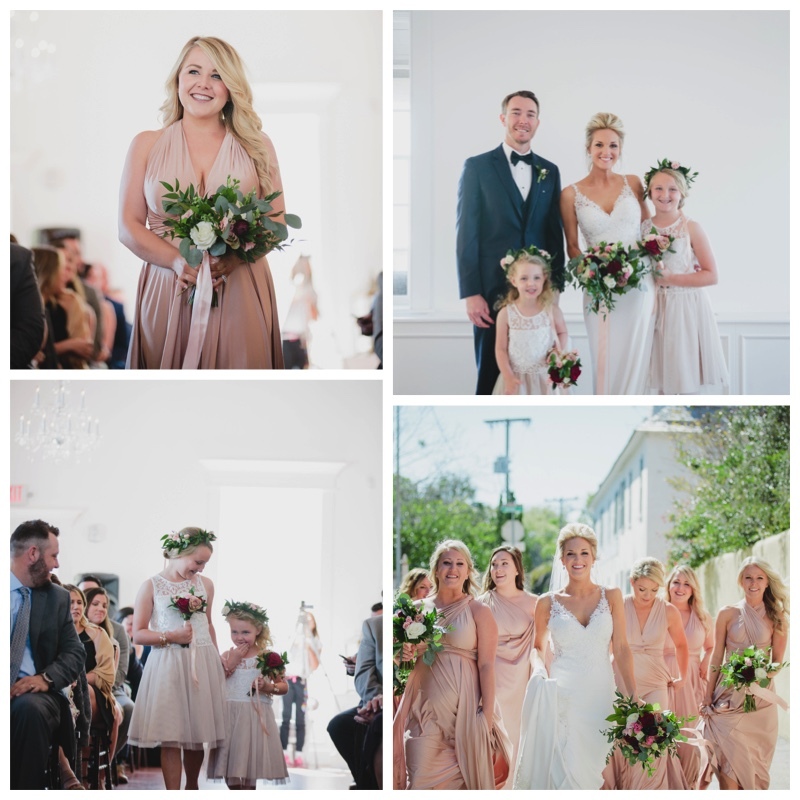 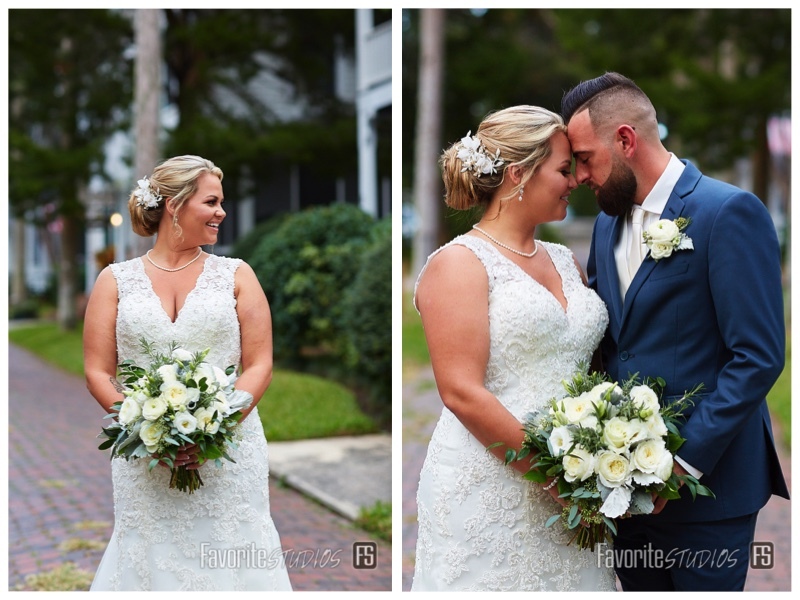 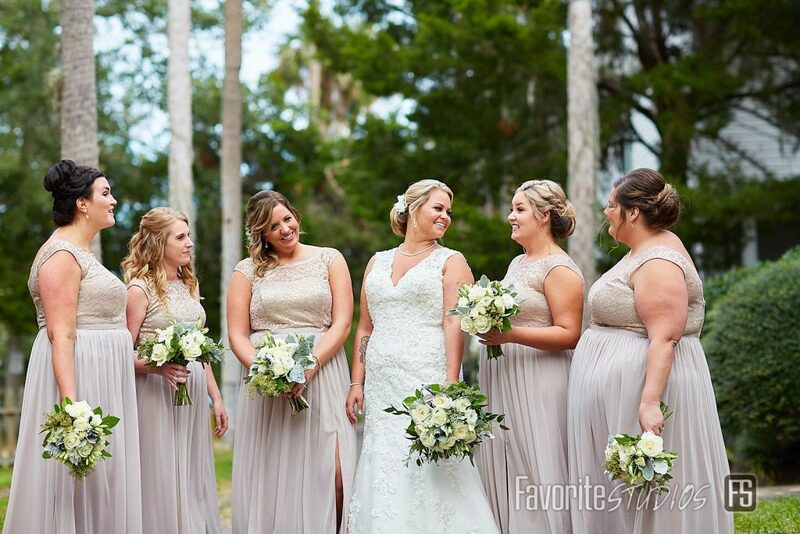 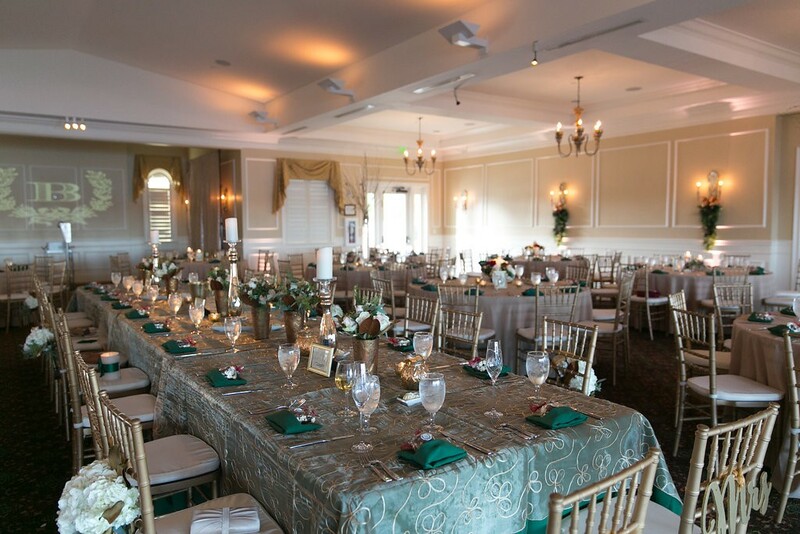 Lauren & Kevin were married in a gorgeous ceremony at the Riverhouse in St. Augustine. 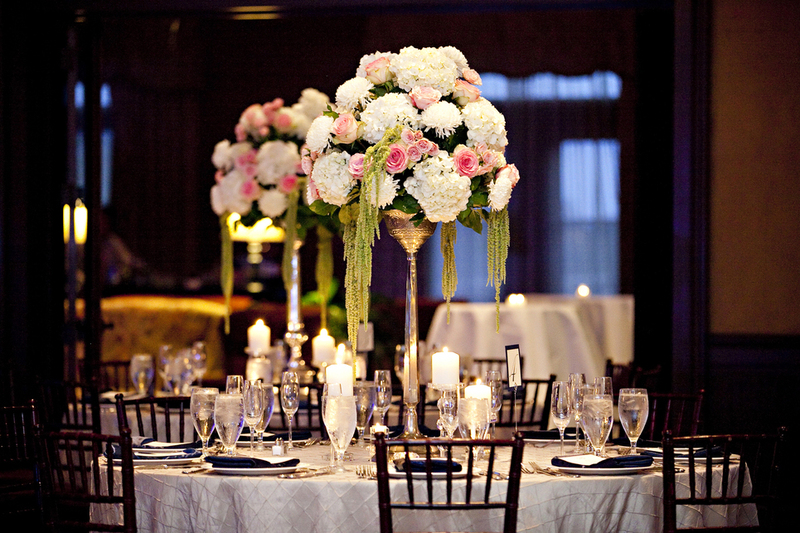 We were honored to be able to provide the florals for their wedding day. 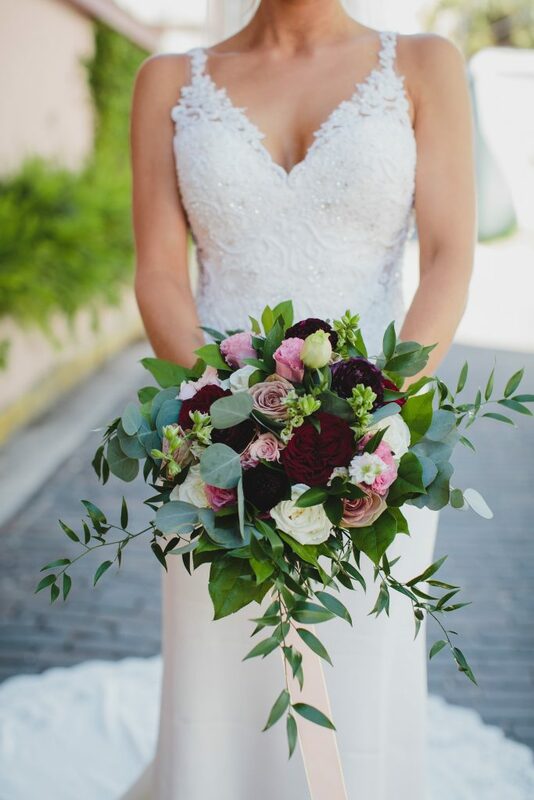 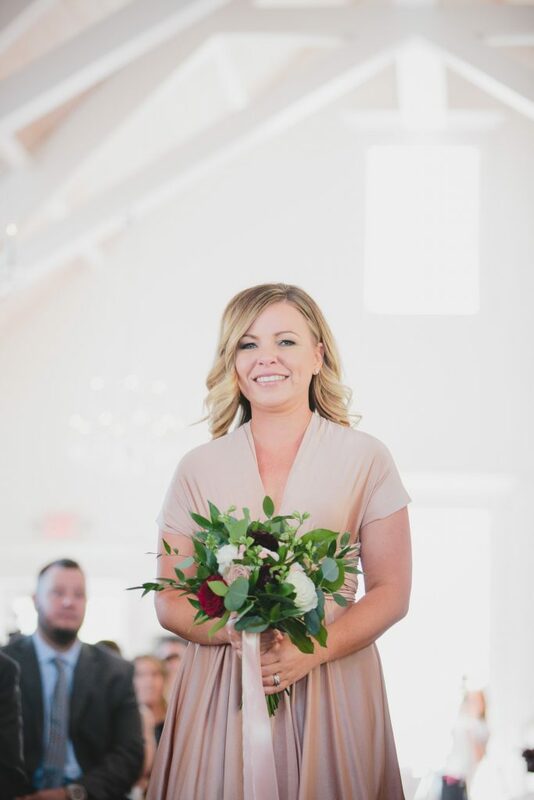 Lauren’s bouquet was a hand tied natural look bouquet created with porcellano spray roses, light pink peonies, snowball mums, white lisianthus, astilbe and touches of dusty miller. 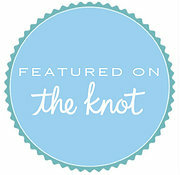 It was wrapped in ivory lace ribbon and accented with Lauren’s grandmother’s broach. 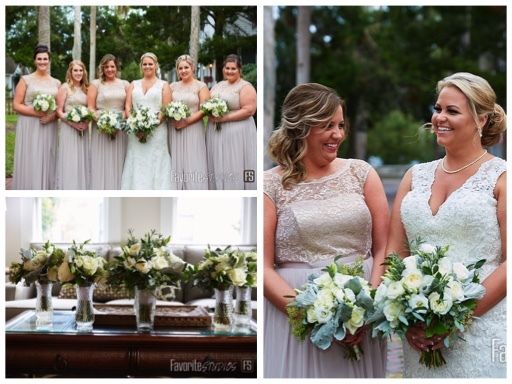 Her bridesmaids bouquets were hand tied and created with succulents, porcellano spray roses, light yellow stock, white wax flower and white stock. 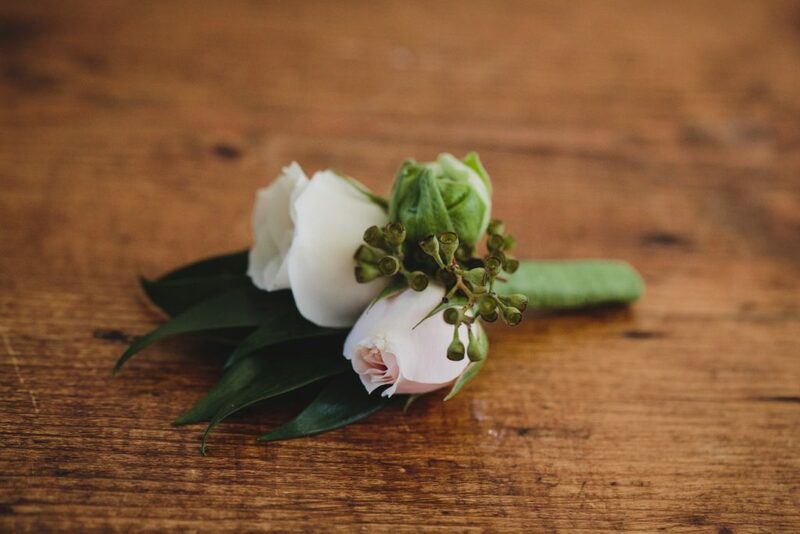 Their stems were wrapped with burlap ribbon. 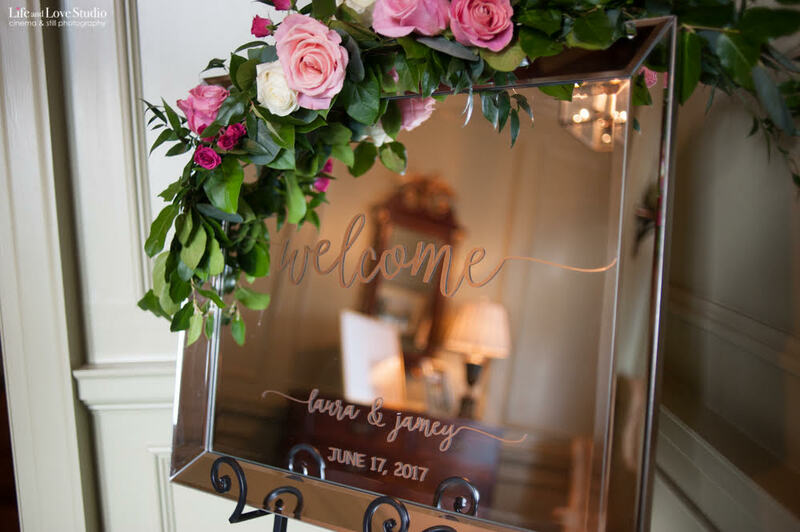 We also provided the florals & decor for her ceremony and reception, with special touches of their initials in moss hanging on the door.